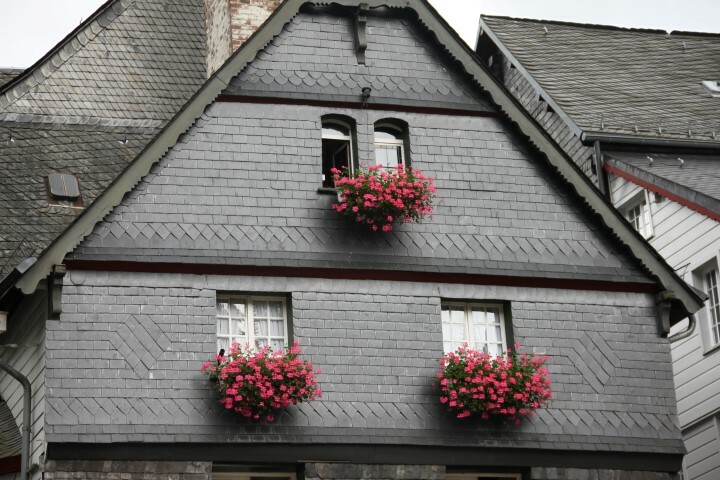 As regular readers will know, I’m documenting our 2012 travels through (snippets) of Europe with our visiting friend “Velvetine” from Singapore. 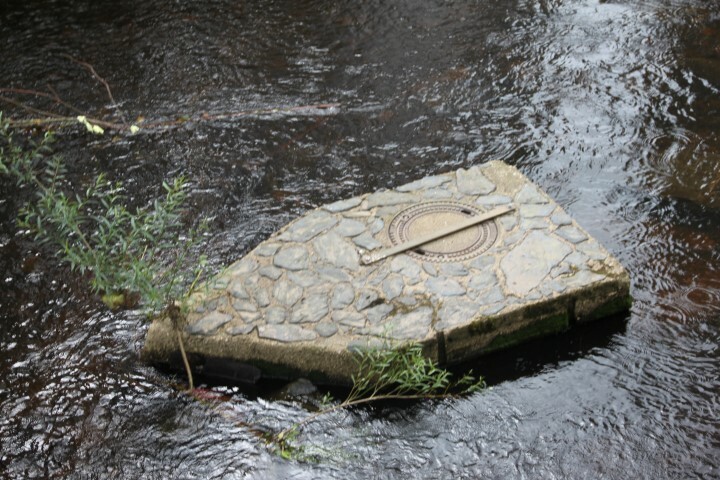 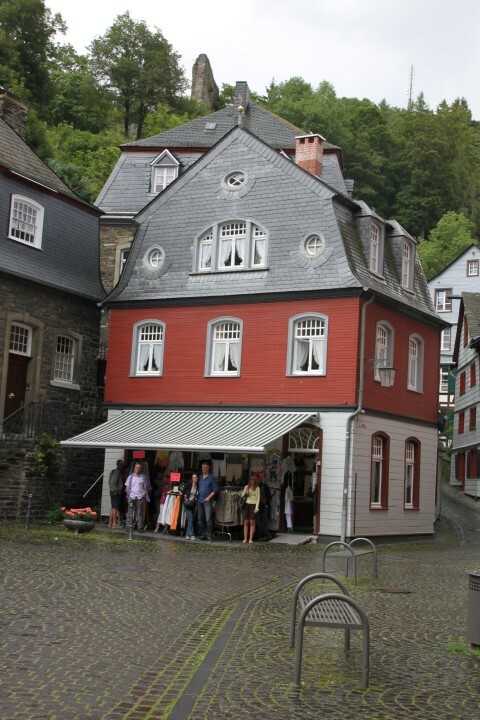 Here, in my last post from the town of Monschau, Germany, we are slowing walking back towards where the car is parked.We are about half way there when suddenly the heavens open and we are deluged with rain. 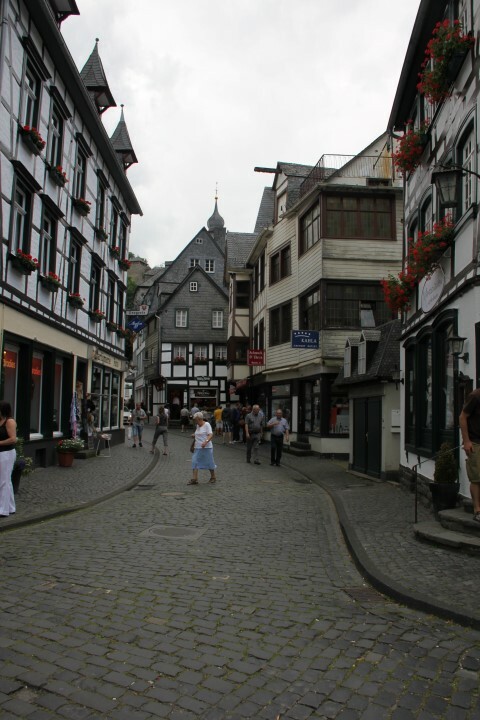 Tourists and locals scatter alike and we are forced to sprint up the street and across another large square. 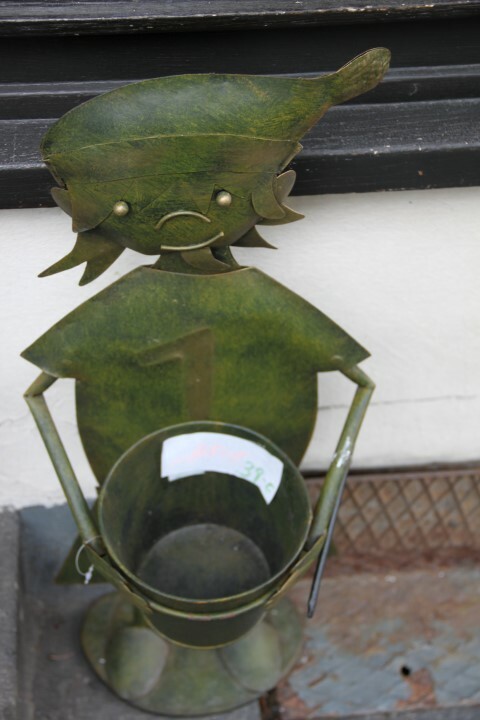 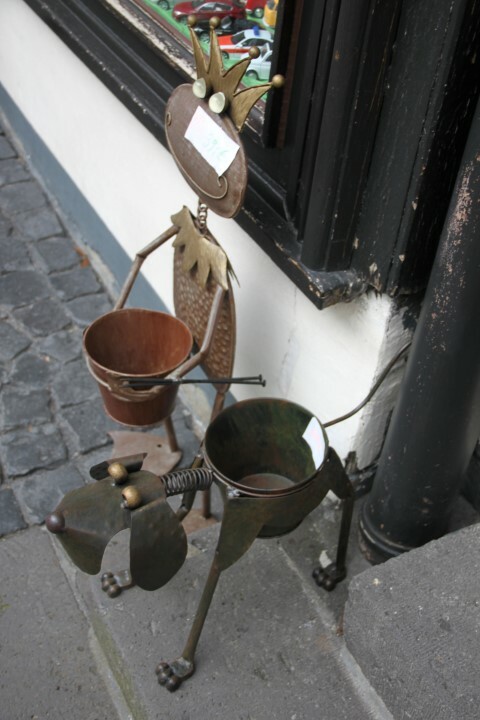 I say “sprint”, but in truth the able-bodied amongst us fended for themselves and raced ahead, and I got to go as fast as crutches would allow at the rear, arriving in the shop doorway they were sheltering in looking like a drowned rat. 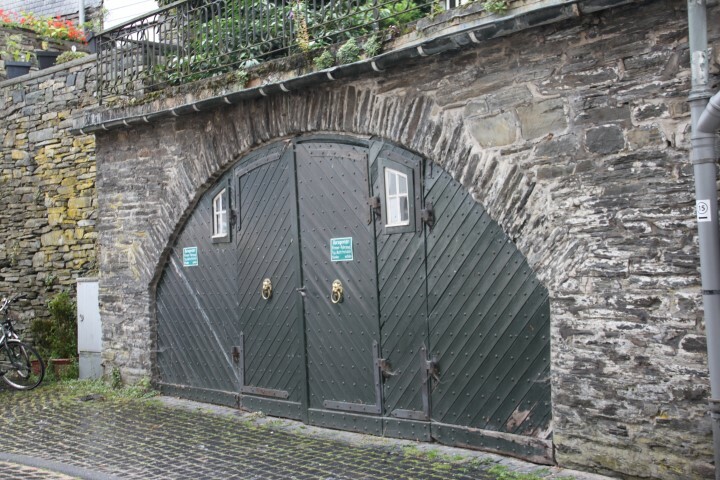 The doorway was crowded with other tourists taking shelter, but we all squeezed in until the worst of it passed and soon the squall had gone and the sun shone again. 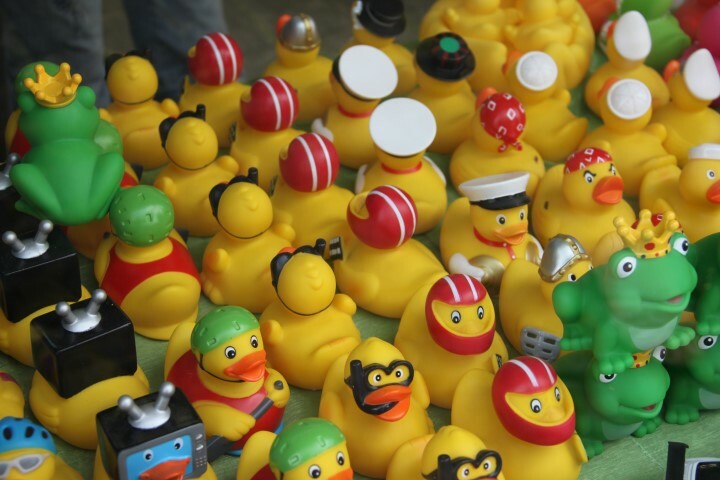 The shop in question sold souvineers and knick-knacks, but the all important thing the kids wanted to drag me inside for was the impressive display of toy rubber ducks. 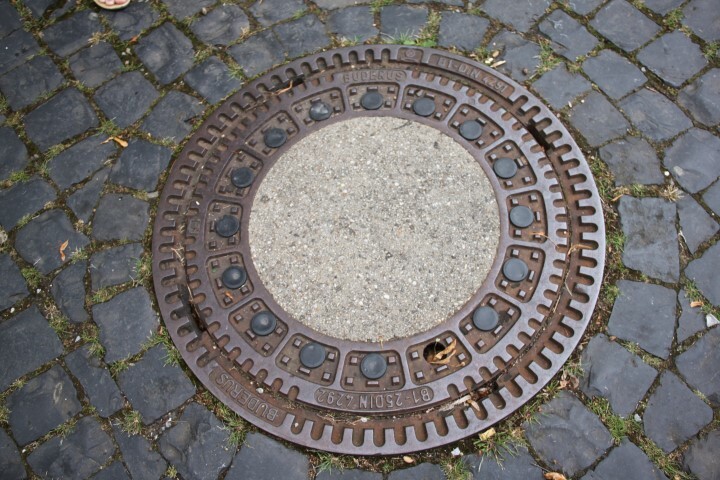 Aaaagh! 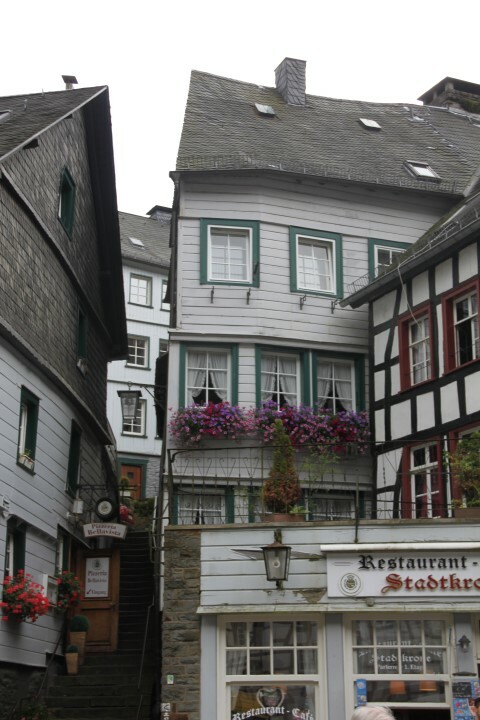 The Structural Engineers Are Coming!!! 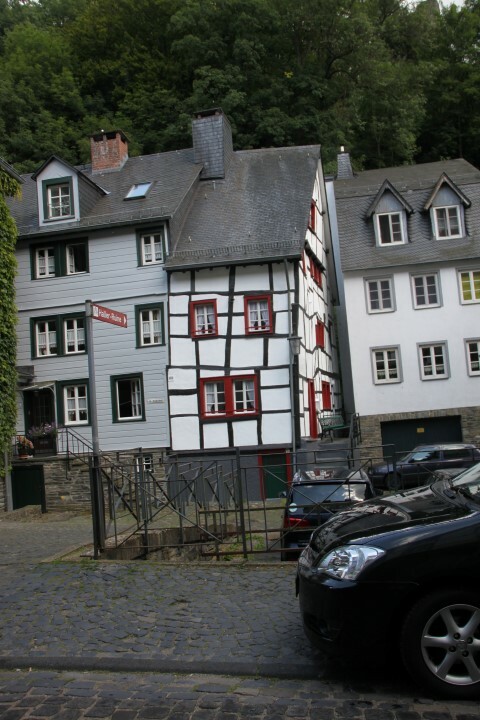 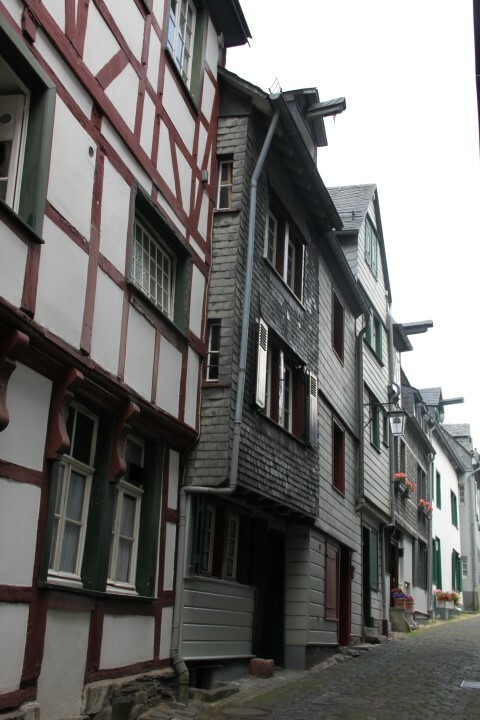 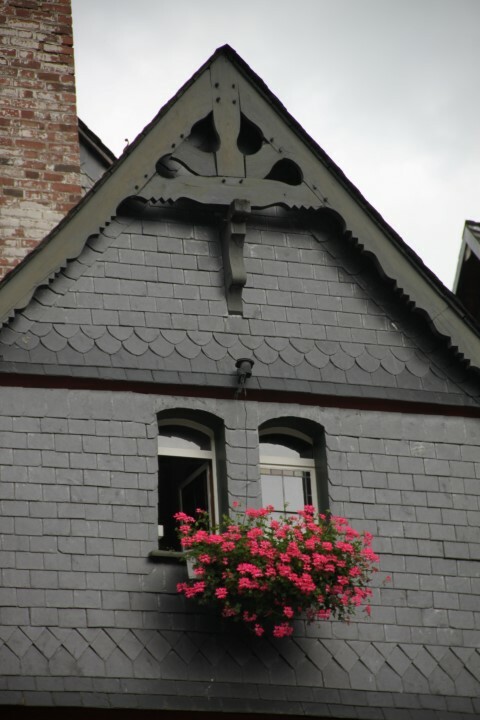 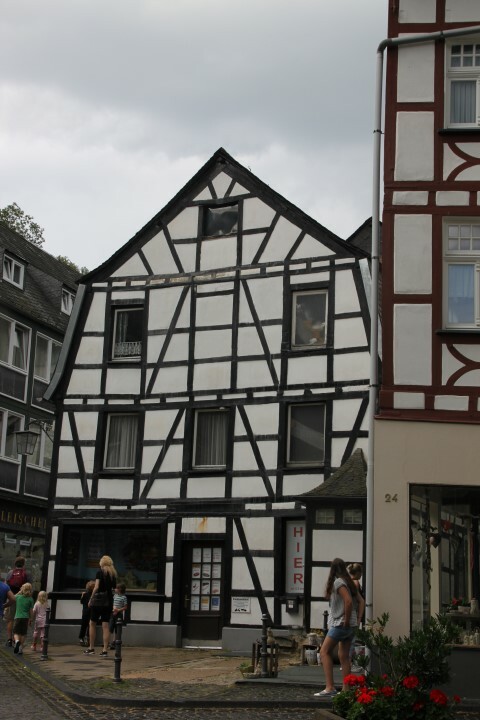 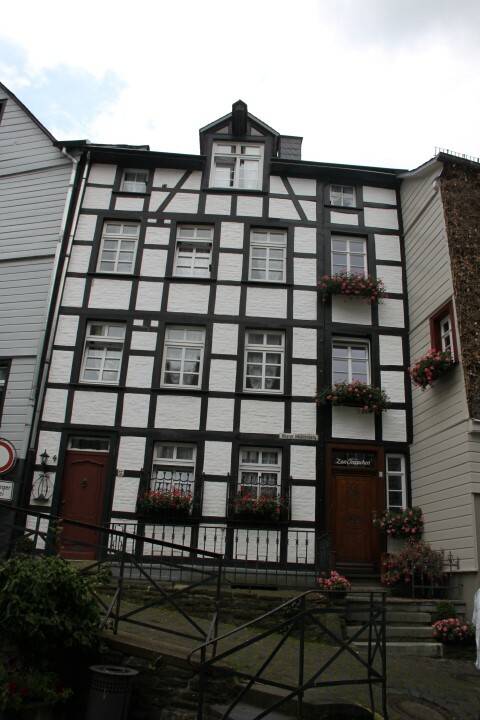 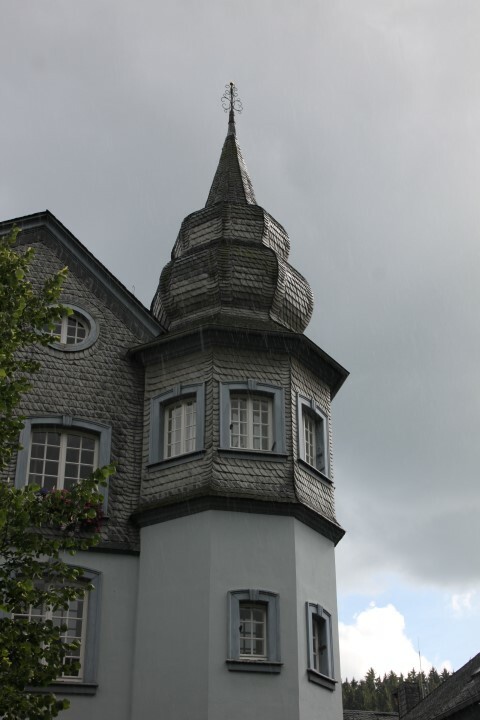 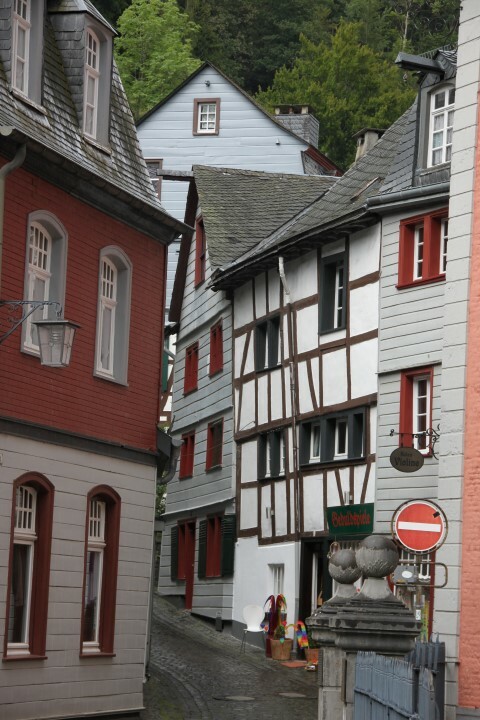 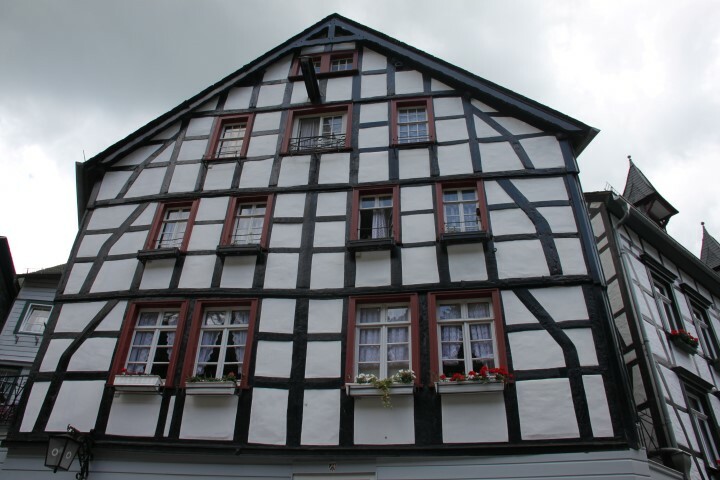 I know that not everyone shares my off-beat sense of humour, so maybe this post is one that only I appreciate… When photographing this set of houses in Monschau, Germany in the summer of 2012, it struck me that the middle house in this photo looks like it has a worried “face” on it. 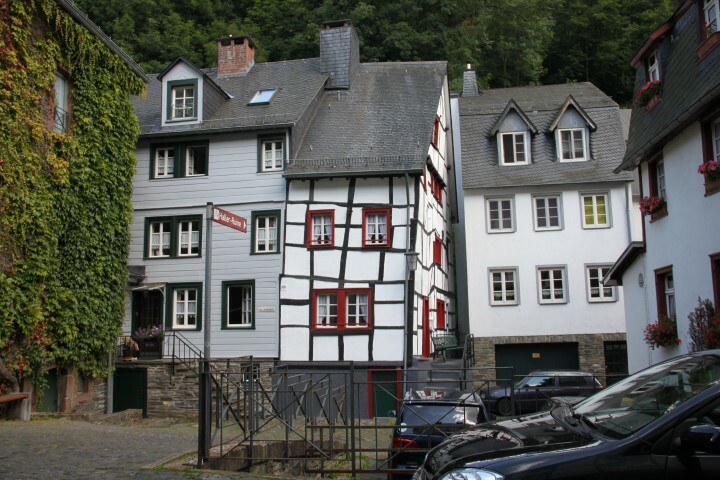 I stared at the photos and started to come up with possible captions to put underneith it, and because of the view that the side of the house affords, my best effort was ” AAggghh, I hear that the structural engineers are due to visit!“. 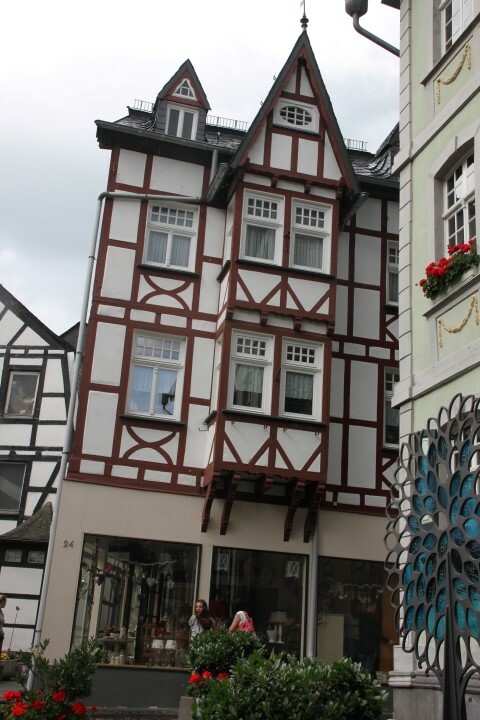 Is it just me who sees something funny in this building? 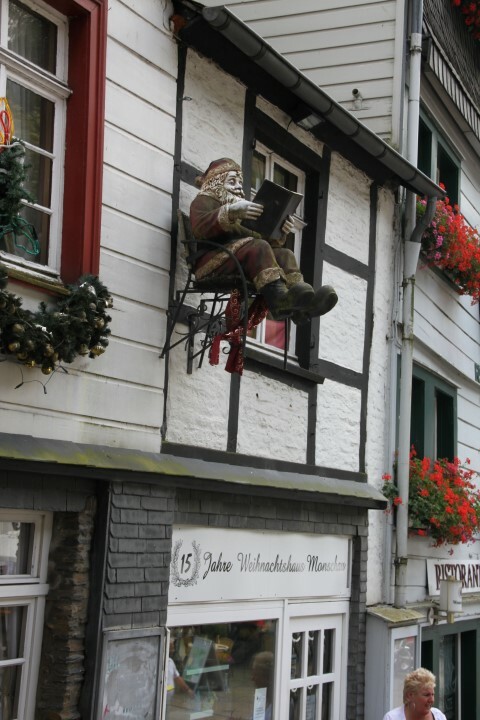 If it’s not just me, your captions would be most welcome! 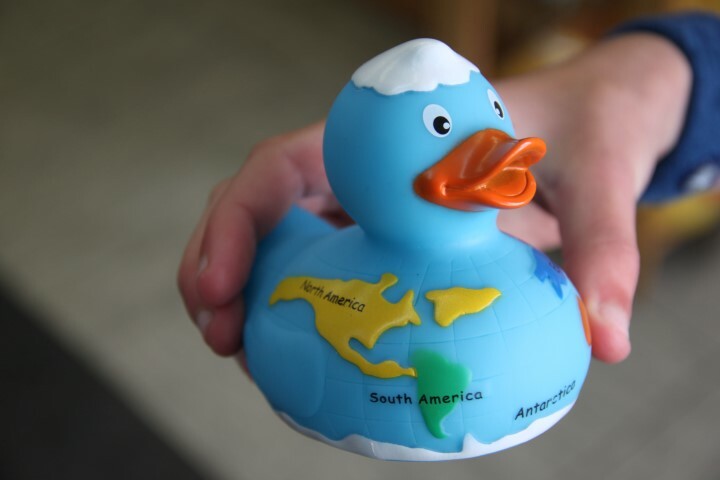 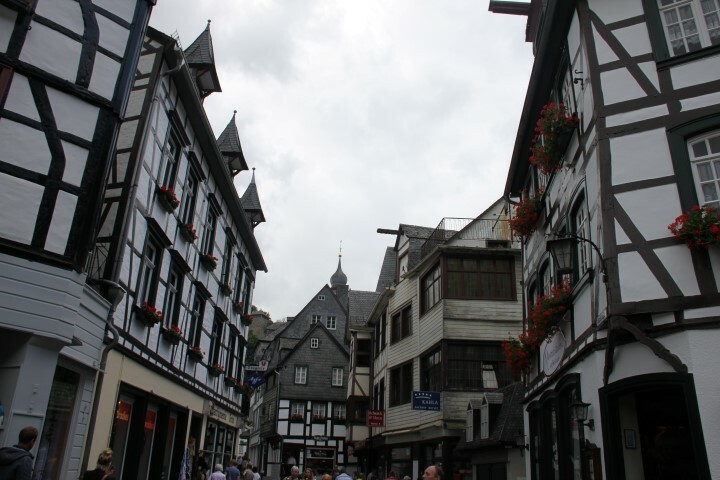 Another blog post detailing our 2012 summer travels with visiting Singaporean friend “Velvetine”. 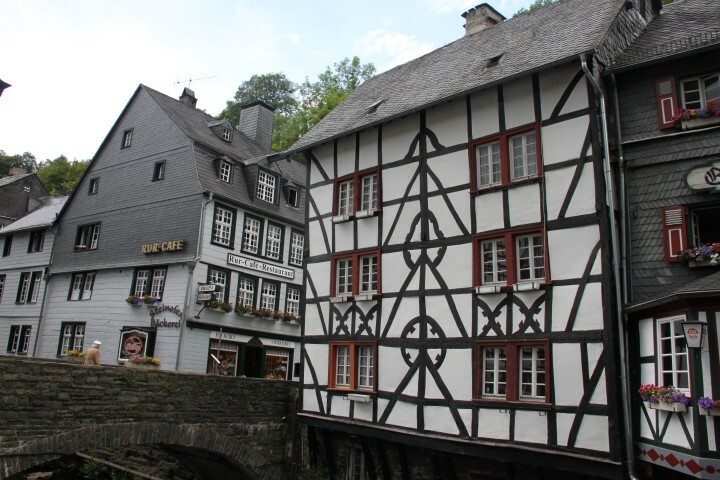 Monschau (French: Montjoie, Walloon: Mondjoye) is a small resort town in the Eifel region of western Germany located in the district Aachern, North Rhine-Westphalia. 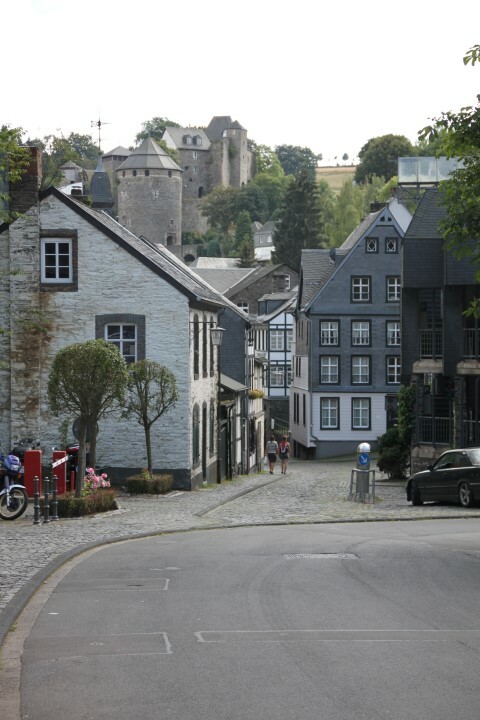 On the heights above the city is Monschau castle, which dates back to the 13th century — the first mention of Monschau was made in 1198. 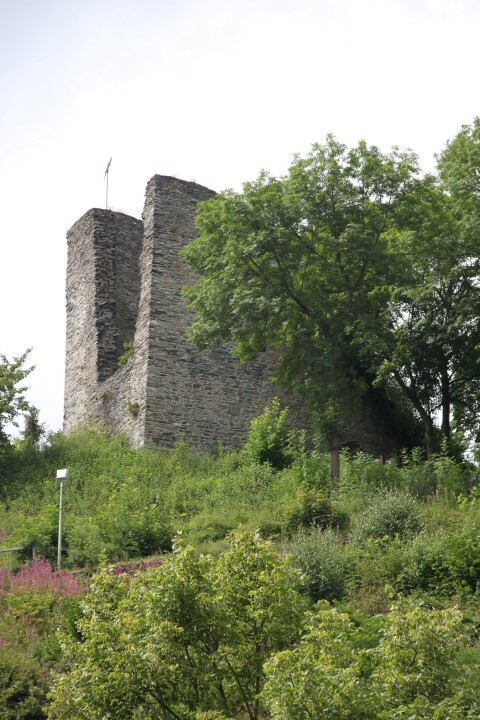 Beginning in 1433, the castle was used as a seat of the dukes of Jȕlich. 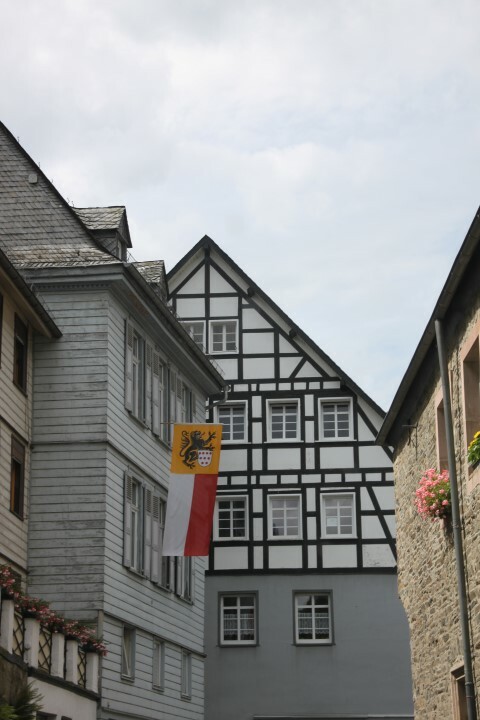 In 1543, Emperor Charles V besieged it as part of the Geldern Feud, captured it and plundered the town. 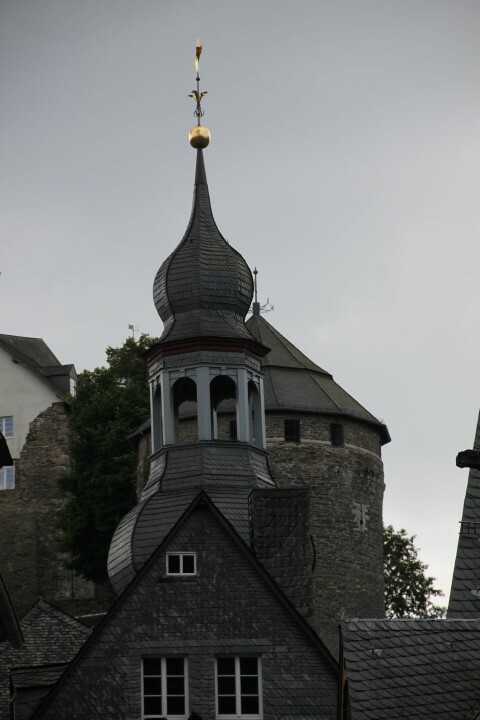 However, the castle stayed with Jülich until 1609, when it became part of Palatinate-Neuburg. 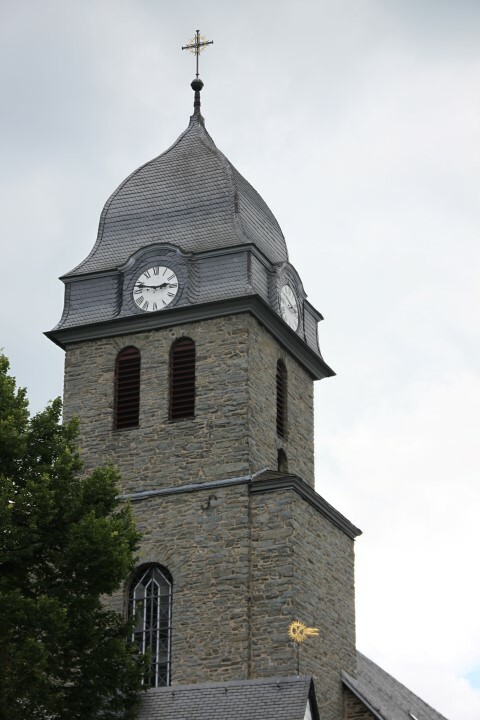 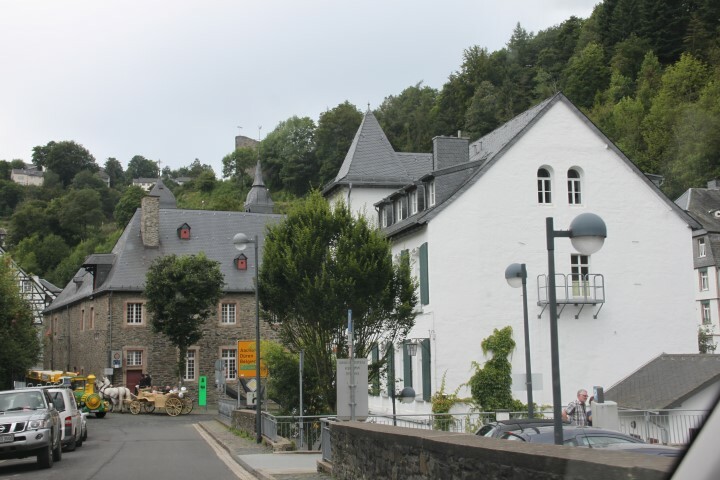 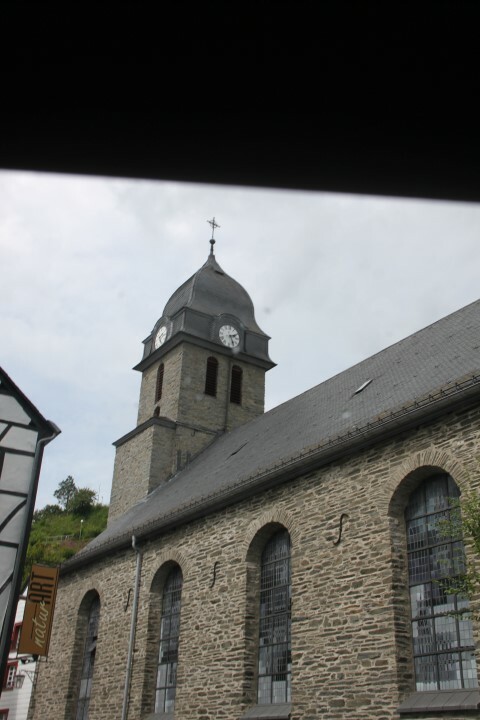 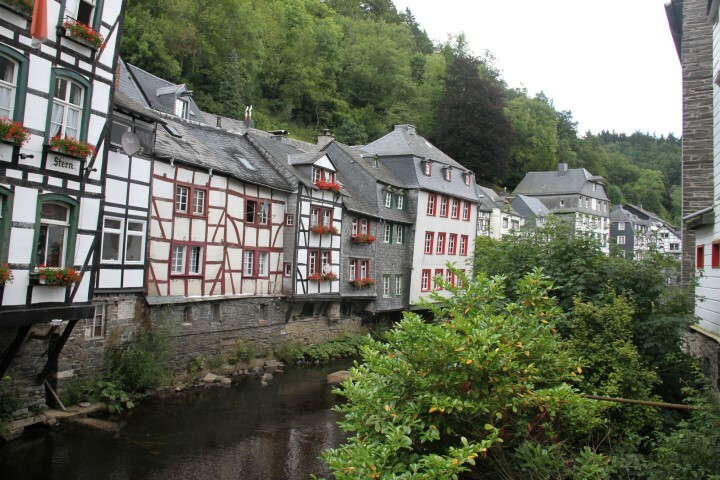 In 1795, the French captured the area and, under the name Montjoie, made it the capital of a canton of the Roer département. . After the area became part of the Kingdon of Prussia in 1815, Monschau became the district capital of the Kreis Montjoie. 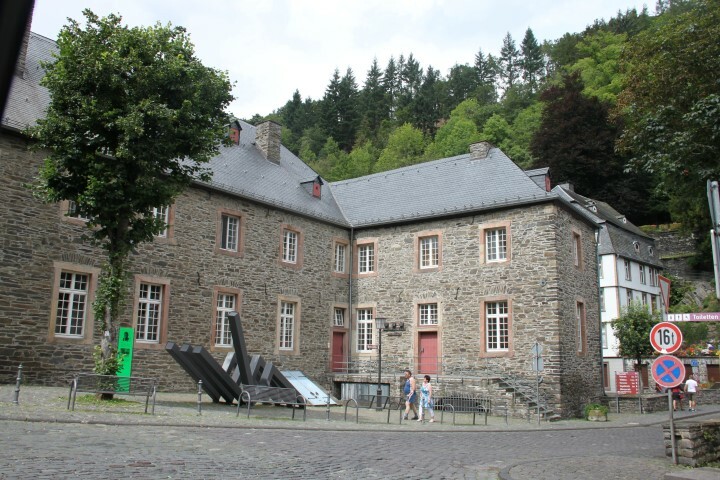 During World War I, some people argued that Monschau (or “Montjoie” as it was then still called) should be annexed to Belgium since they believed it historically to be a Walloon area that had been Germanized by the Prussians. 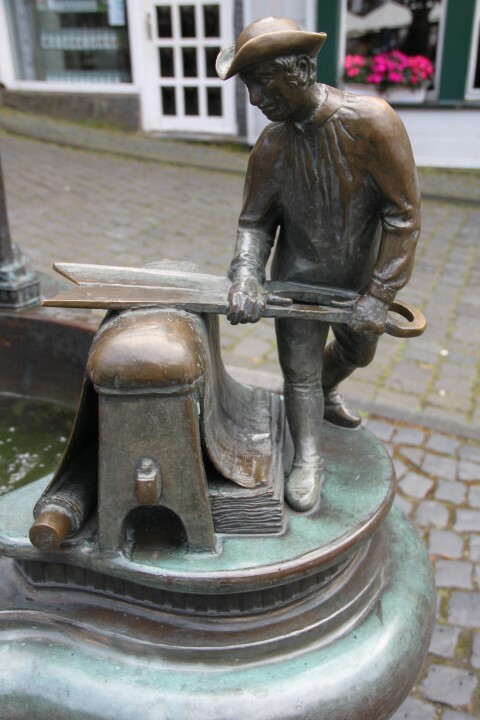 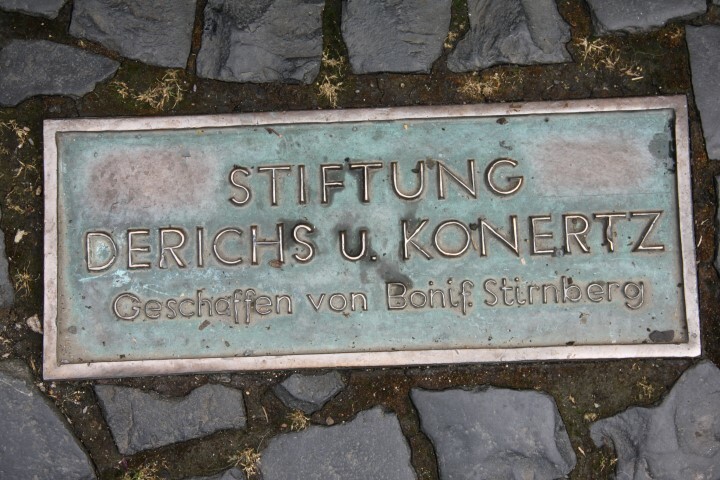 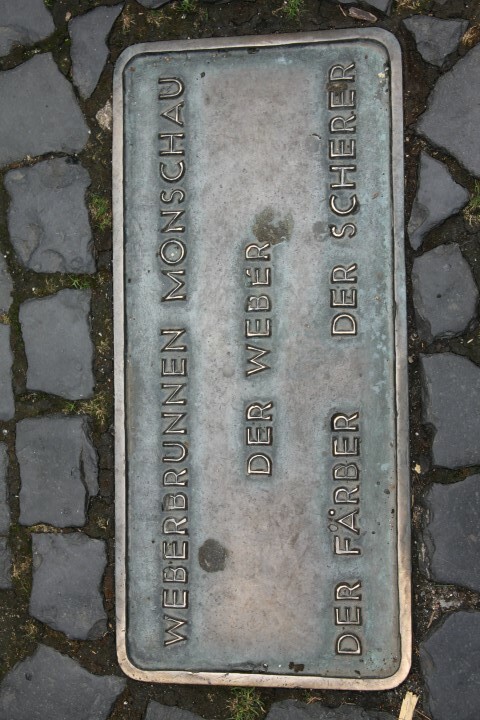 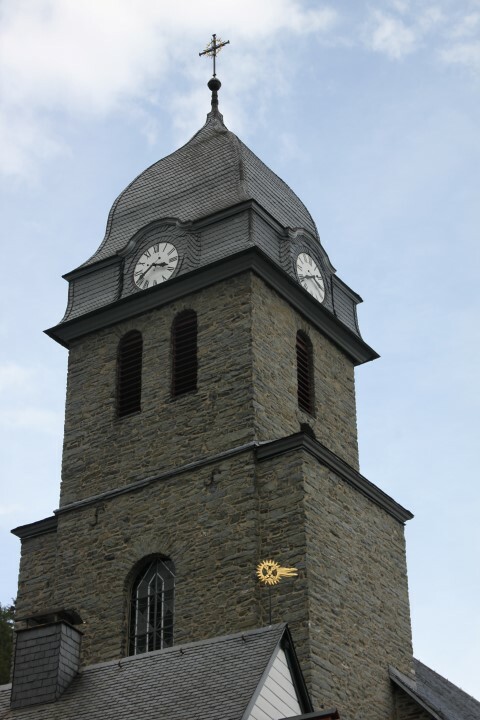 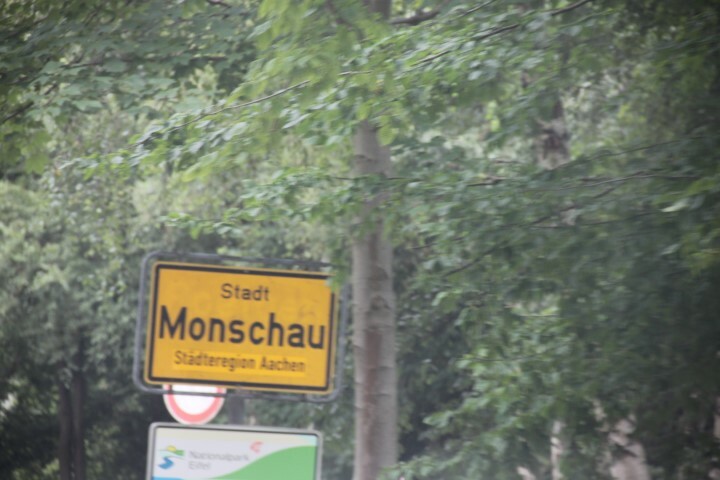 In 1918, William II, German Emperor, changed the name to Monschau.In 1972, the town was enlarged with the previous independent municipalities of Höfen, Imgenbroich, Kalterherberg, Konzen, Mützenich and Rohren. 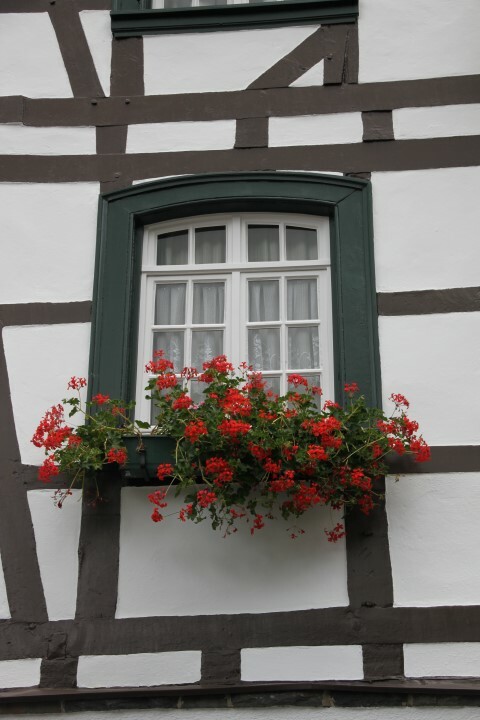 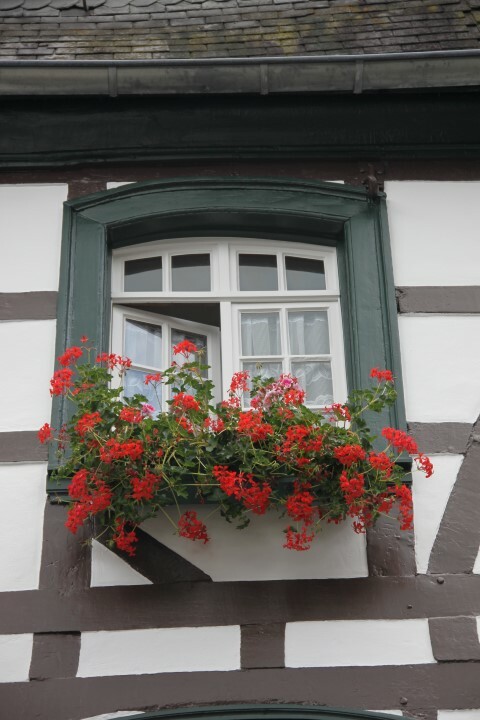 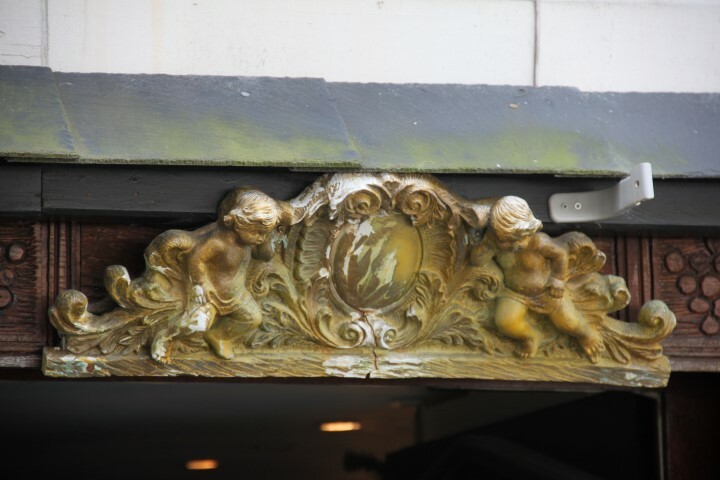 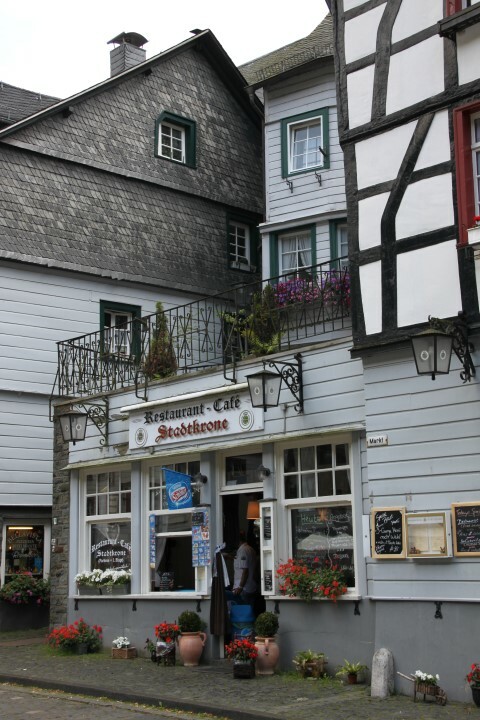 There are details everywhere, from the half-timbered patternes in the wood, decorations on the cafe’s, the patterns in the roof tiles, and brightly coloured and often co-ordinated flower boxes that adorn the windows. 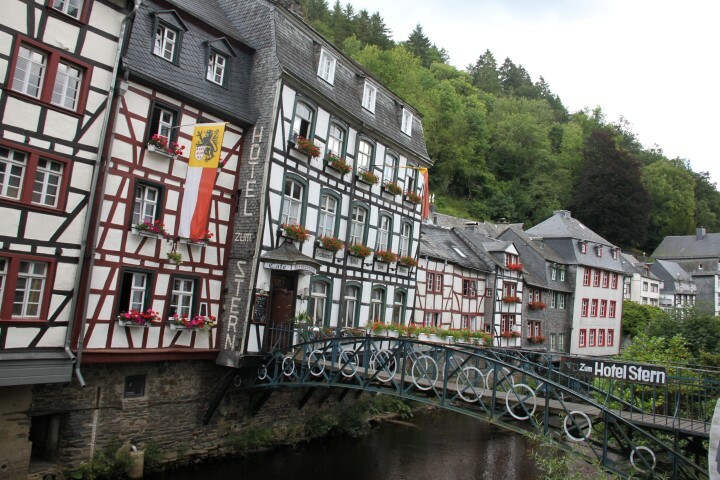 Preened and ready for the tourist cameras, Monschau knows how to present it’s pretty face to the world. 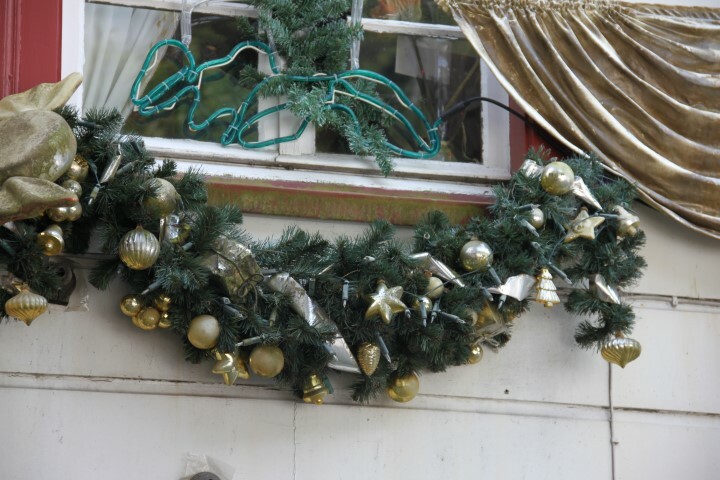 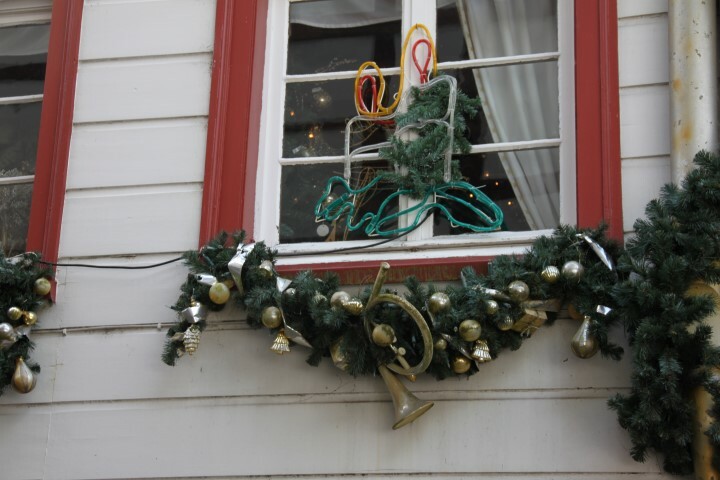 You Too Can Have Christmas In August! 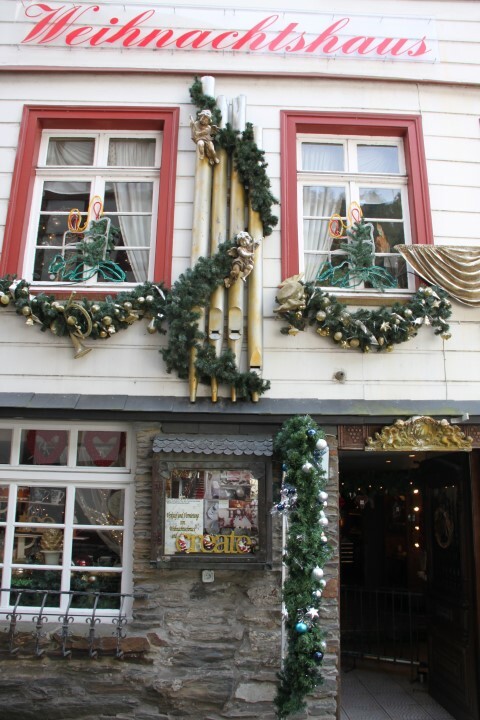 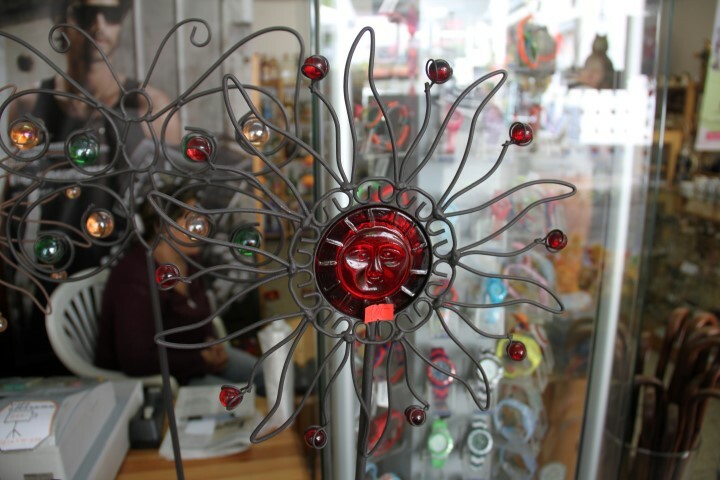 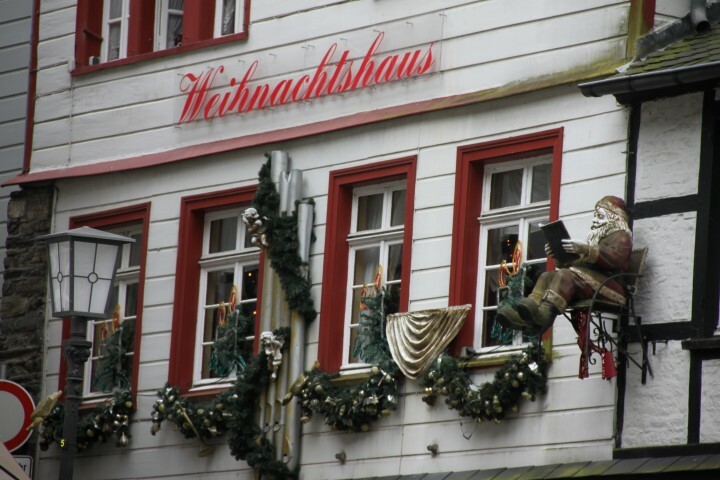 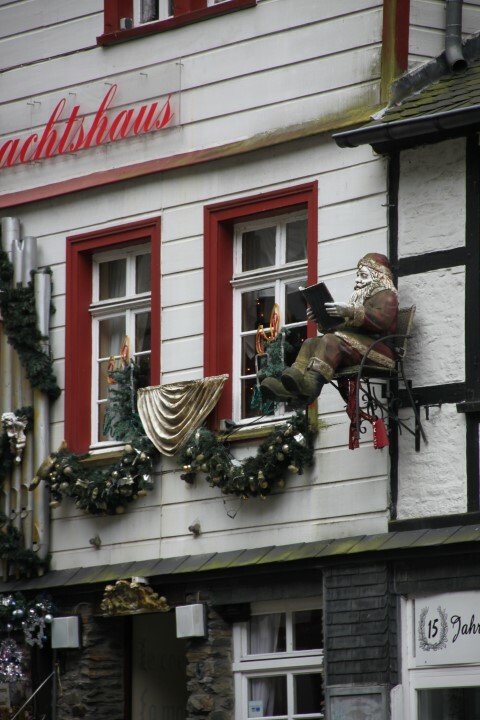 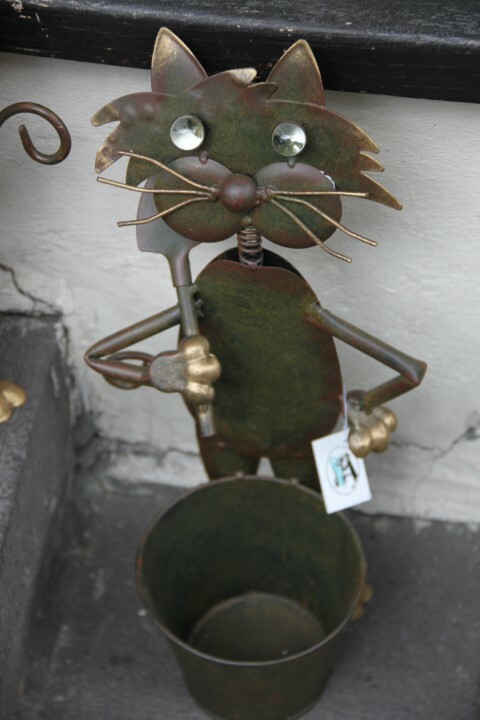 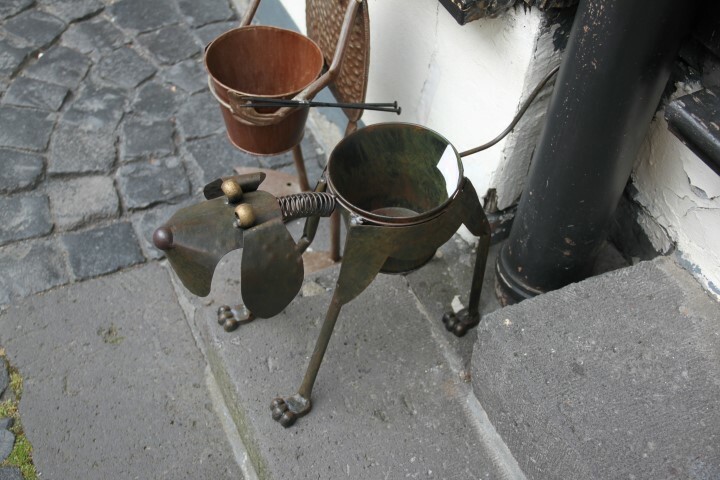 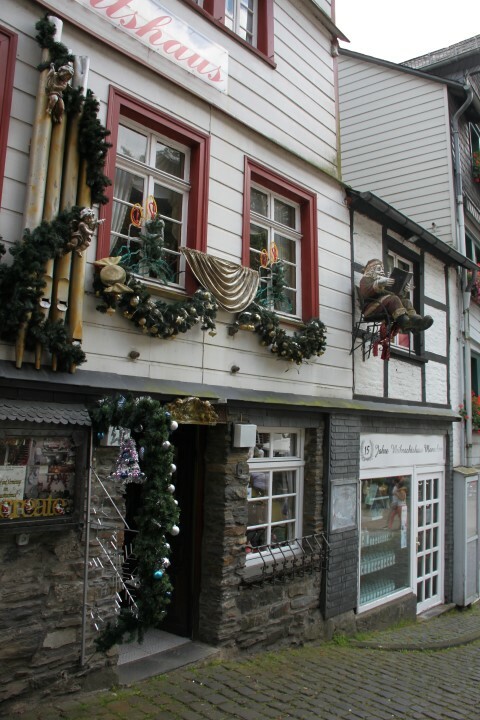 This retrospective blog post finds us in the German town of Monschau, and whilst I learned that it was one of many German towns famous for it’s annual December Christmas Markets, I had no idea that some of the “Christmas” shops are open all year around. 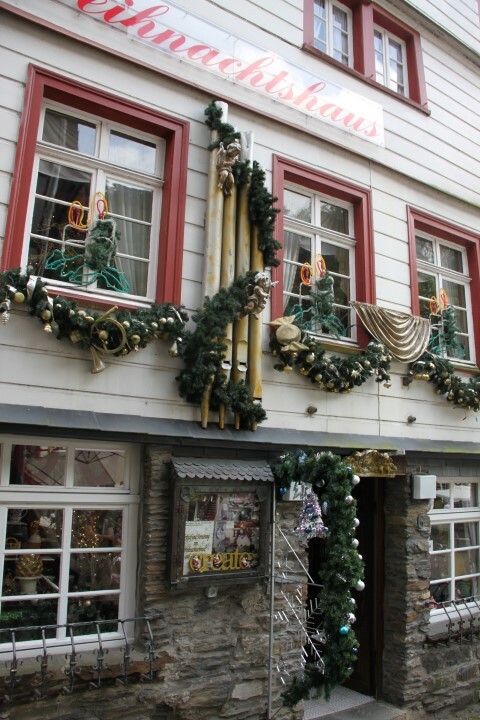 I didn’t go inside, firstly becuase I didn’t want the kids to start begging me for a ton of stuff that we either didn’t want, didn’t need or have any space to take home and secondly because it was so crowded inside I descided not to try and go for a peek there on cruches. 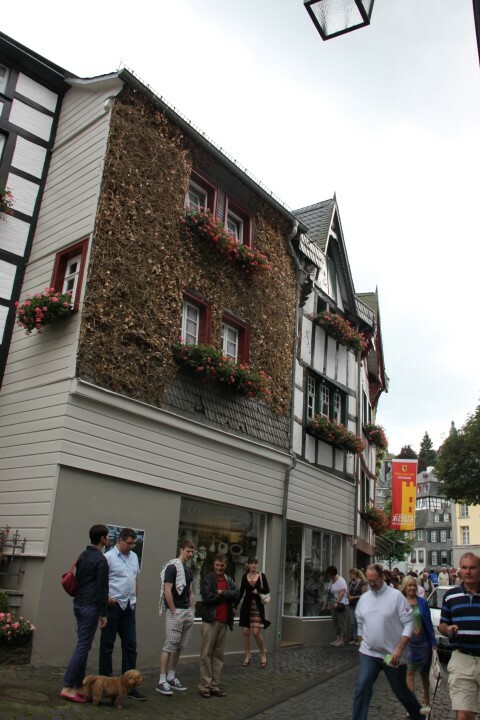 From the doorway it looked like the place was packed rather tight with merchandise and what ever space was over was taken up by browsing (or maybe buying) tourists. 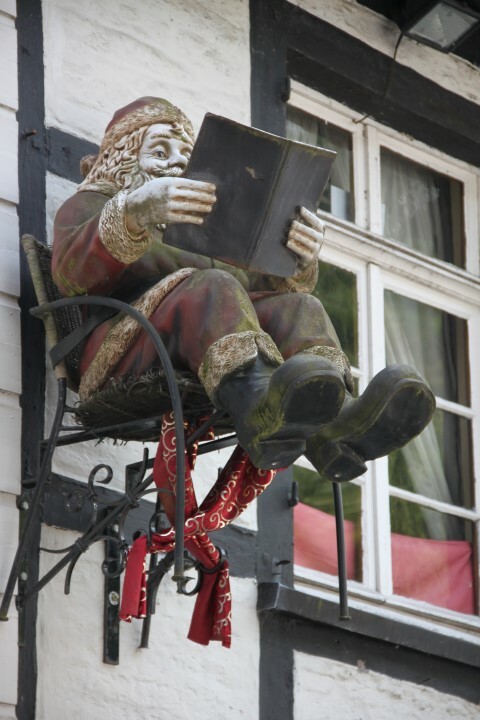 So… here’s something totally unexpected: Complete with Santa on a chair outside: all things “Christmas” in the heat of August! 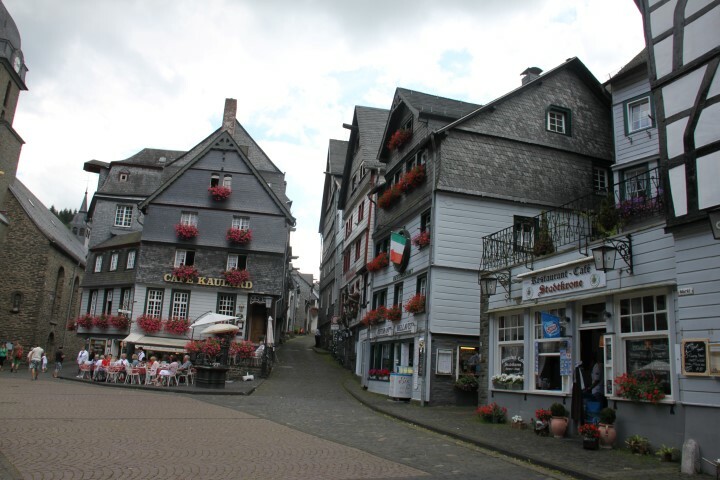 Family Kiwidutch spent part of the summer of 2012 doing a mini-tour of as many counties of Europe that we could squeeze in, taking our visiting Singaporean friend “Velvetine” with us. 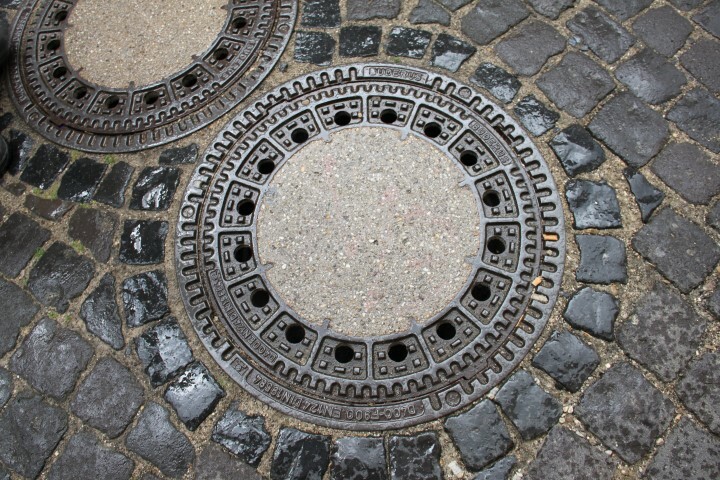 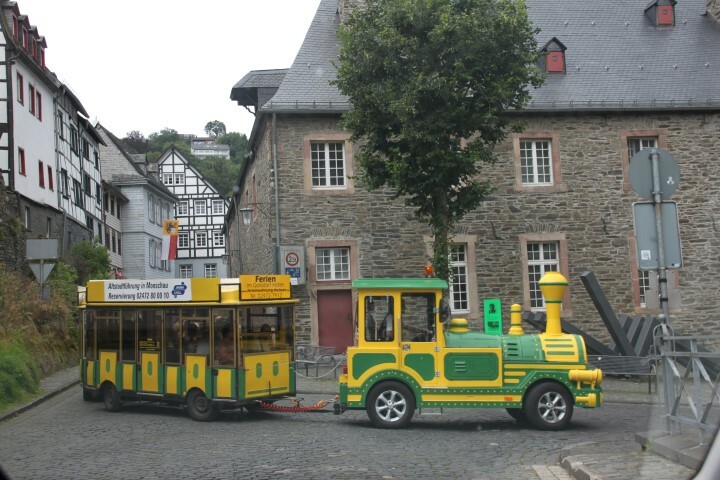 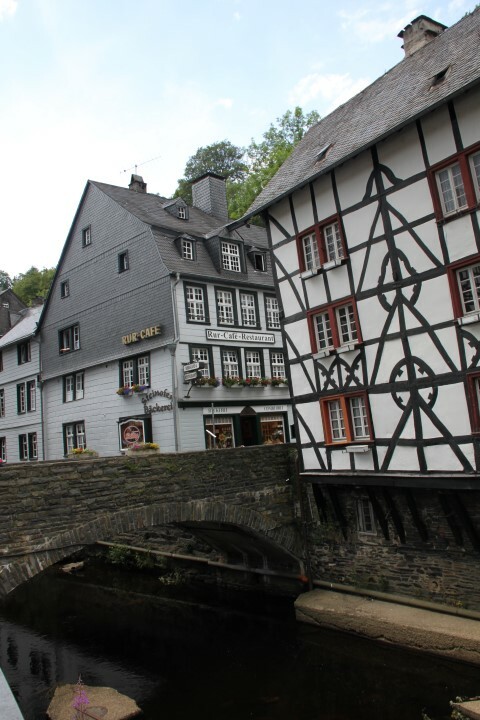 In this post we have been visiting the historic and picturesque town of Monschau in central western Germany. 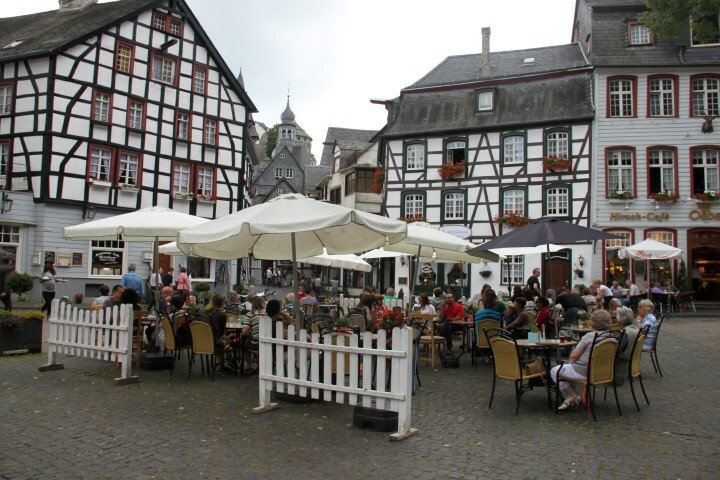 Velvetine and I are semi-hungry and there are sets of tables in part of the little square that are the outdoor seating areas of the restaurants that surround the square. 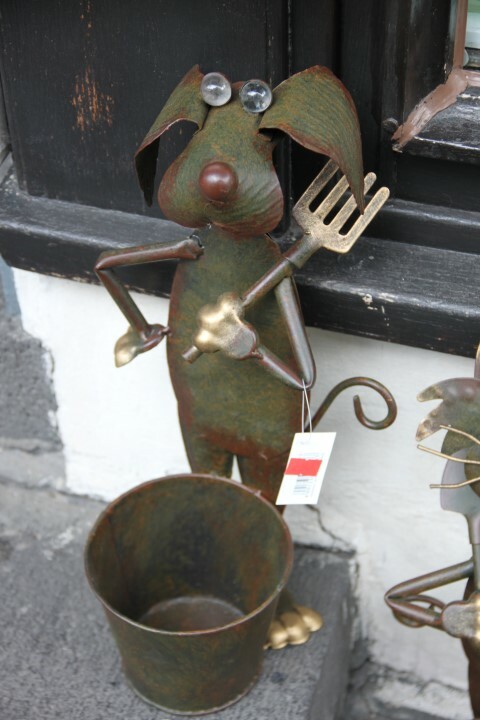 All the tables are in use but Velvetine spies a couple look like they may be getting ready to leave and steps in quickly to ask if they are finished and if we may have their table please. 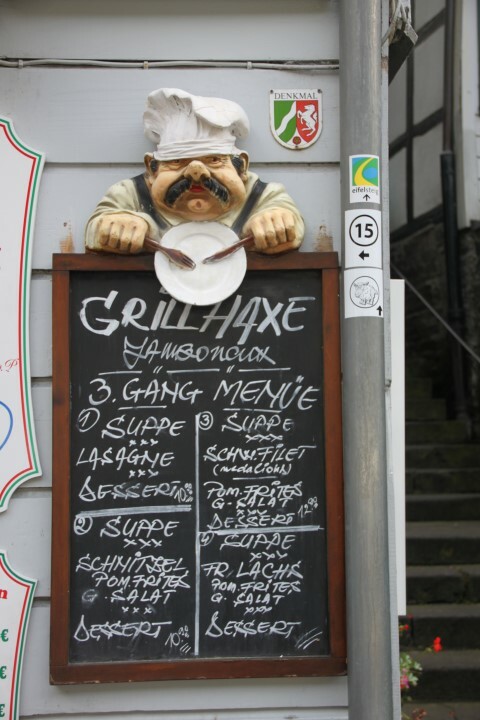 They are and we can, so that settled we browse the menu and settle on something that’s entree size rather than a main course. 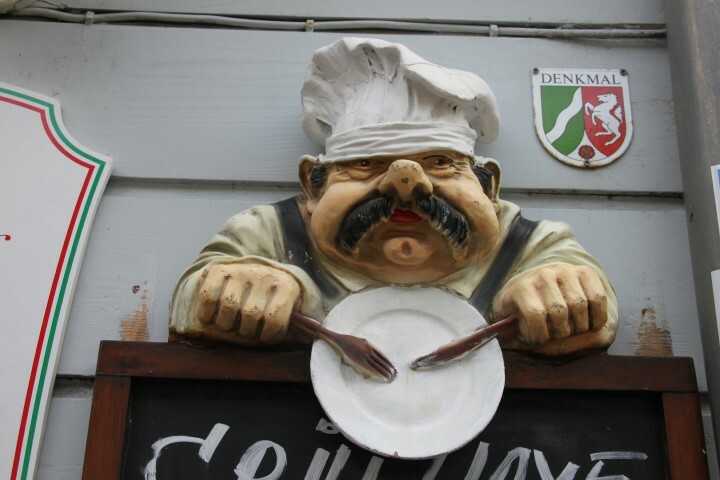 Ordering any meal with meat in The Netherlands usually produces a very small portion and I fully expected that it be the same here. 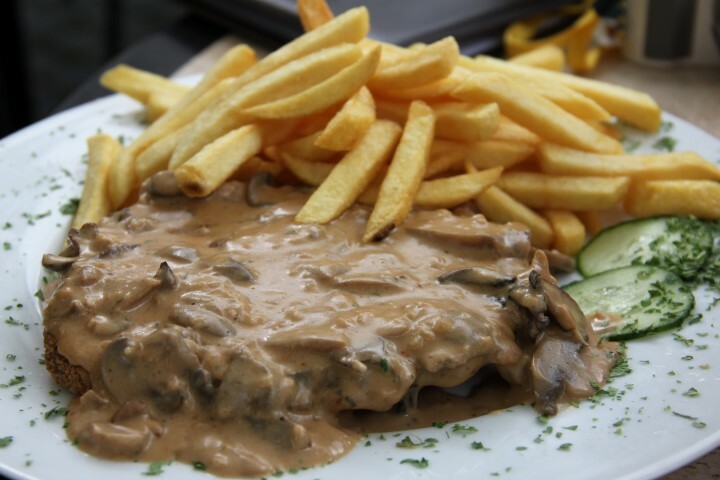 Velvetine orders a schnitzel with mushroom sauce and when it arrives it’s huge! 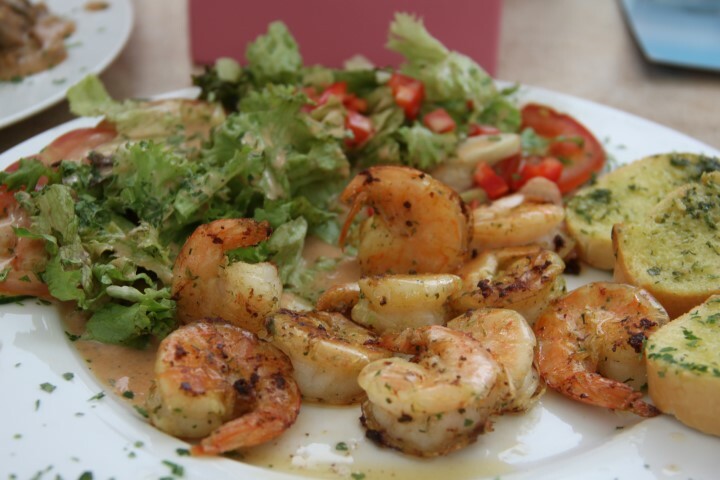 I go for shrimp and salad which was at least a more manageable size and together we struggle through lunch. 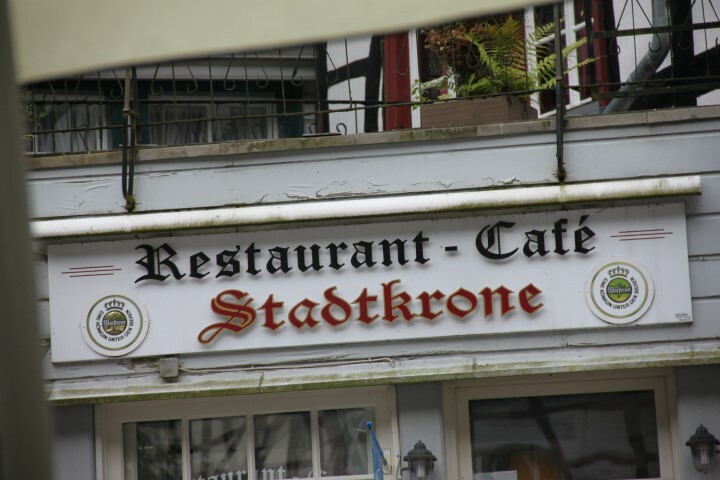 Since I’m allergic to mushrooms I can’t offer to help Velvetine out with the schnitzel, but she makes a really good go at finishing it and says it tasted excellent. 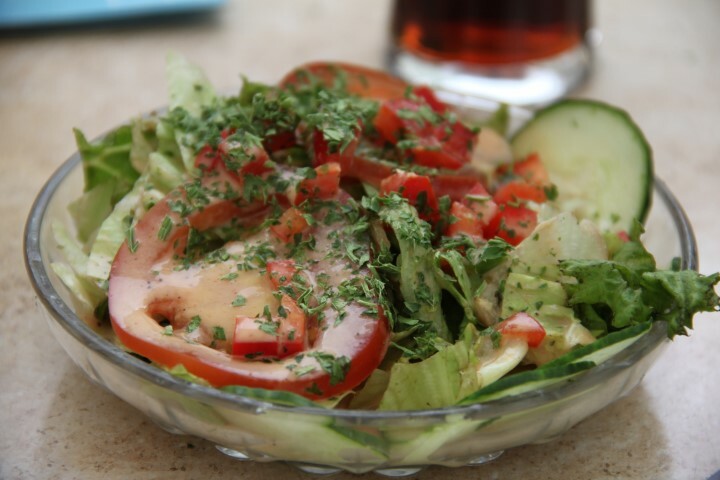 Mine was delicious too, so all in all we enjoyed it a lot. 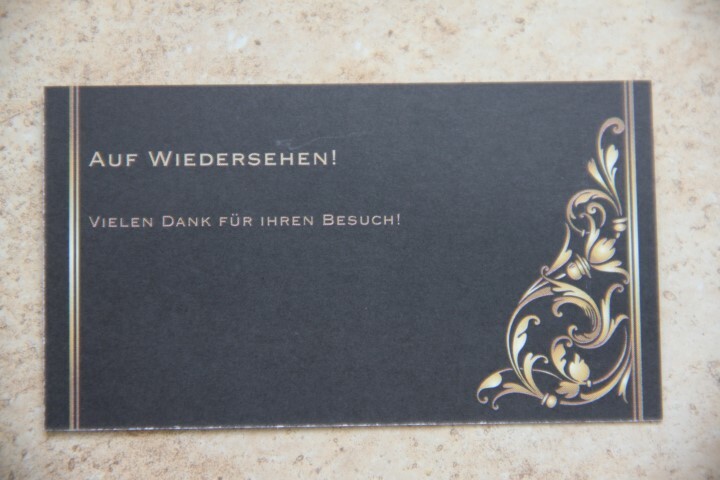 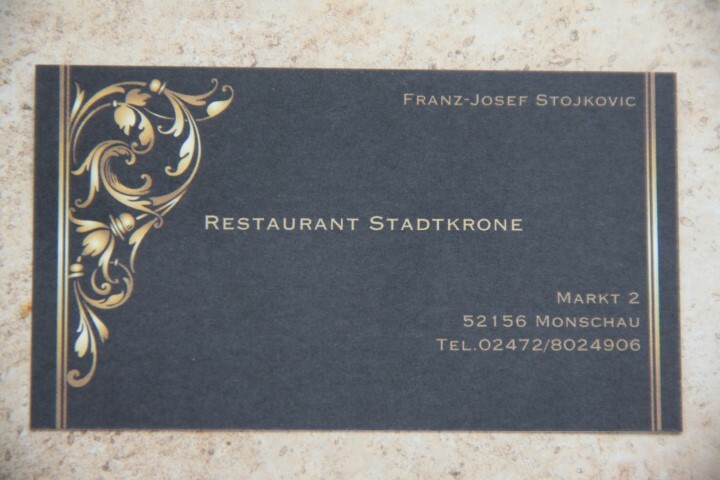 We are dining at the Restaurant, Cafe Stadtkrone, one of a many restaurants and cafe’s surrounding the square. 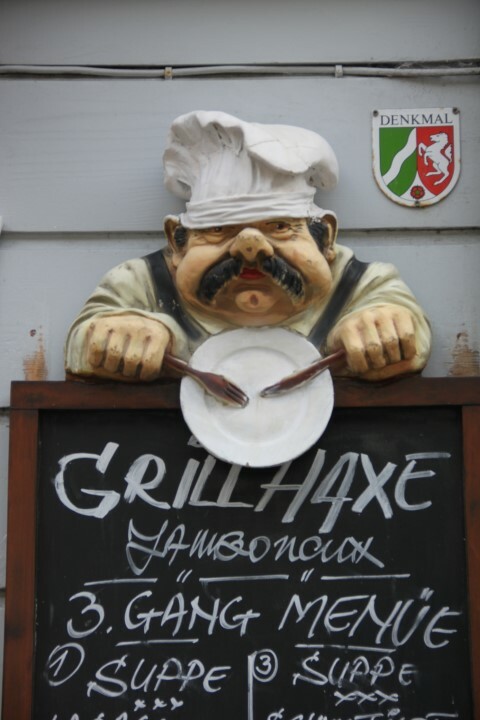 The Italian place next door has a delightful wooden chef on one of their sign boards and I couldn’t resist taking a photograph… and our restaurant is a quirky building that’s half, half-timbered and looks a little like several different buildings perched on a ground floor! 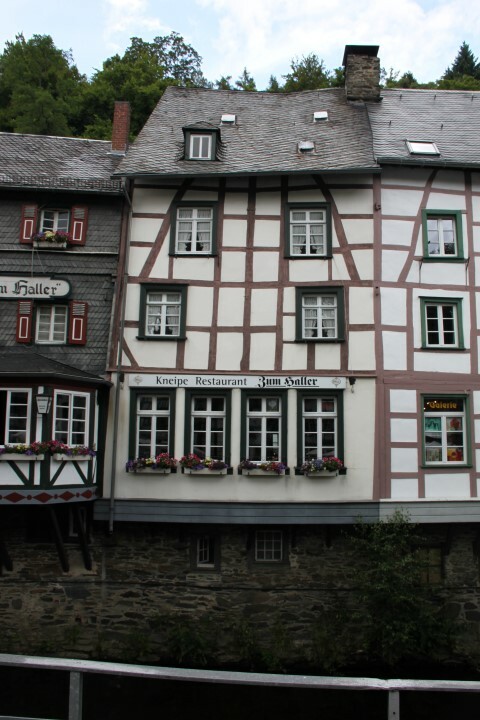 There is certainly no shortage of interesting architecture to enjoy whilst we enjoy our el fresco meal! 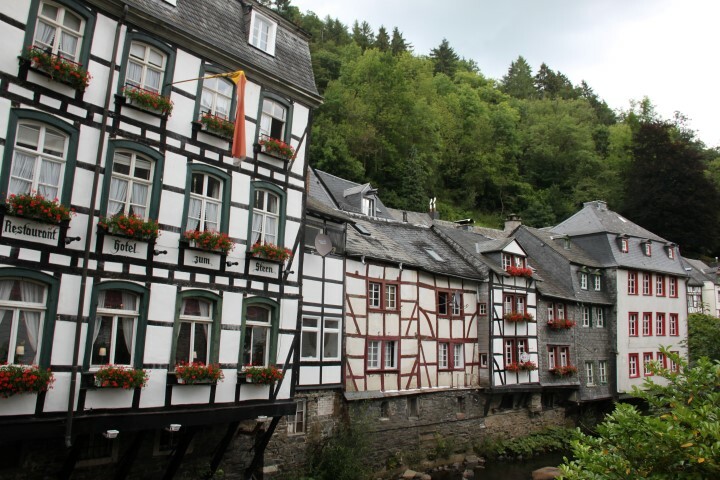 In continuation of yesterday’s post, we find ourselves in the pretty, but heavingly touristic German town of Monschau. 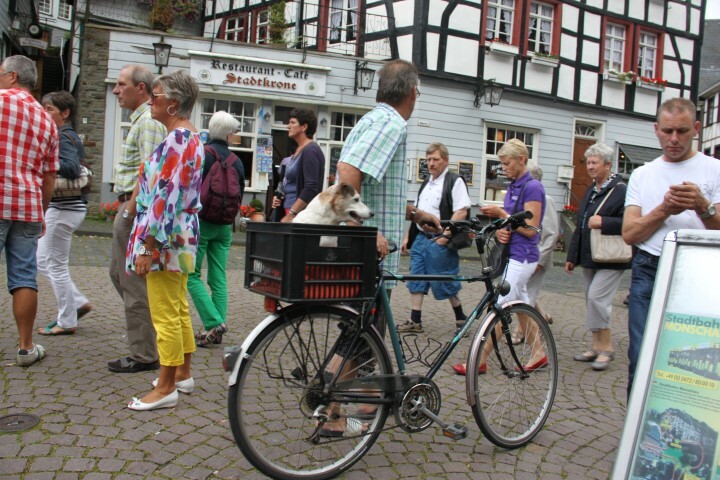 It’s to be expected since it’s August 2012 and the height of the tourist season, so our little group naturally adds to the masses. 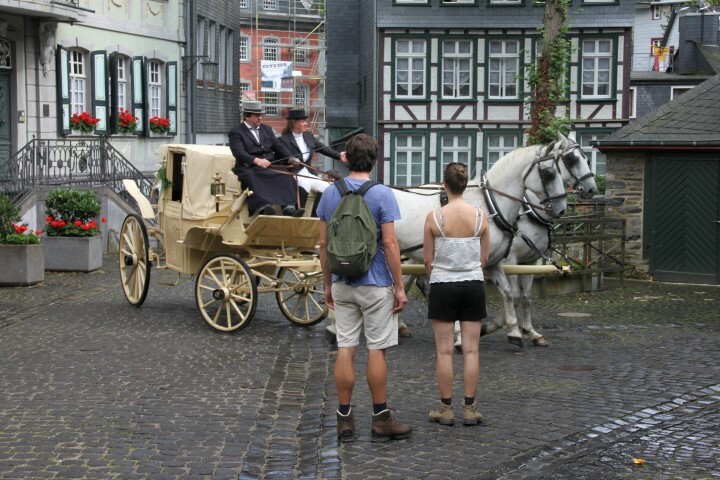 Once Himself has found a place to park the car further afield, he rejoins us and we start to take a look around. 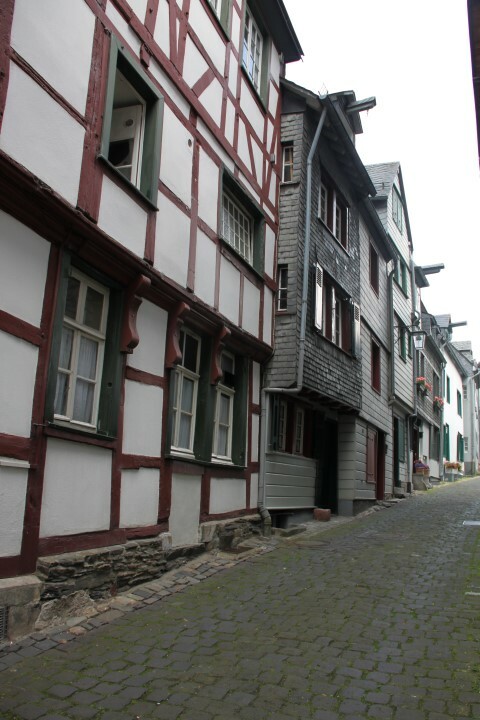 There is enough here to keep Velvetine and I amused for days: there are three hundred year old half-timbered buildings and decorative architecture surround us and we could be busy taking photographs until our cameras cried for mercy if we really set our minds to it. 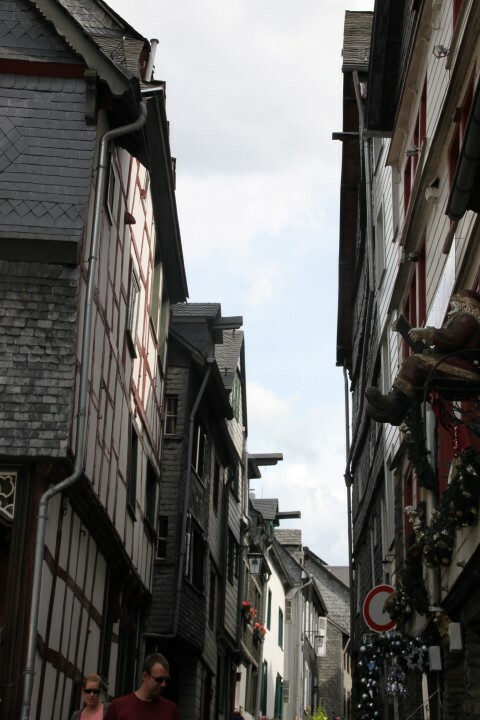 The summer’s day is very hot, so the narrow streets and their deep shade is most welcome but the skies above are slowly starting to show threatening rain clouds so we descide to take photographs and have lunch around this area of town and not try and do the castle as well today.The half timbered buildings are full of quirky details and designs, there is symetery (of a kind) in some of them, since after three hundred years the timbers may be straight, but the walls are not any longer. 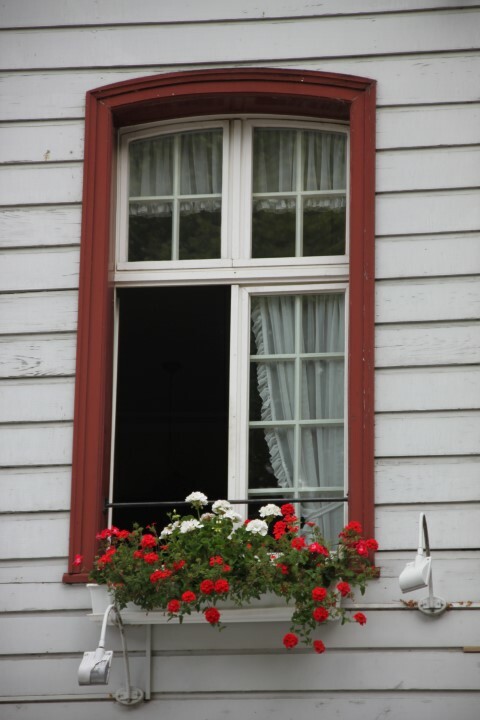 Maybe this is where Mondriaan got his inspiration? 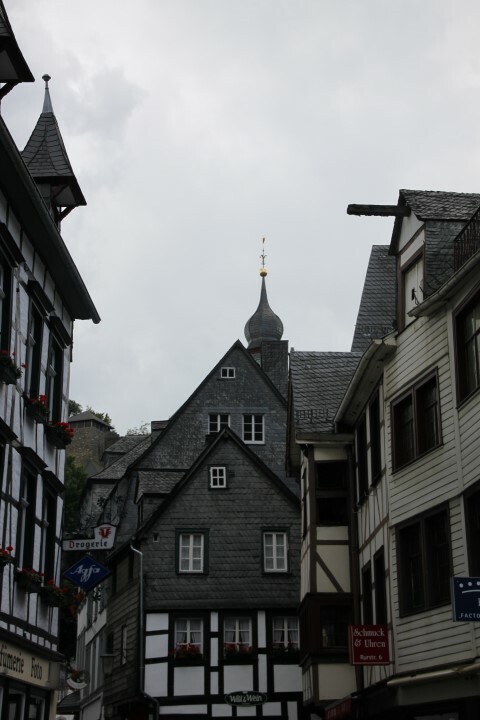 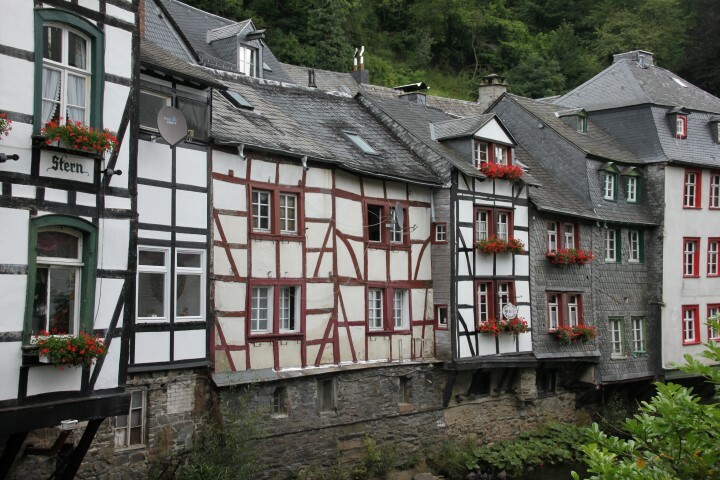 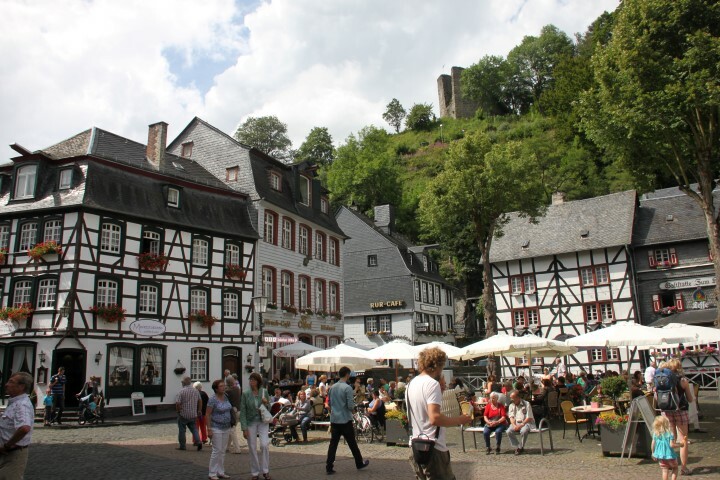 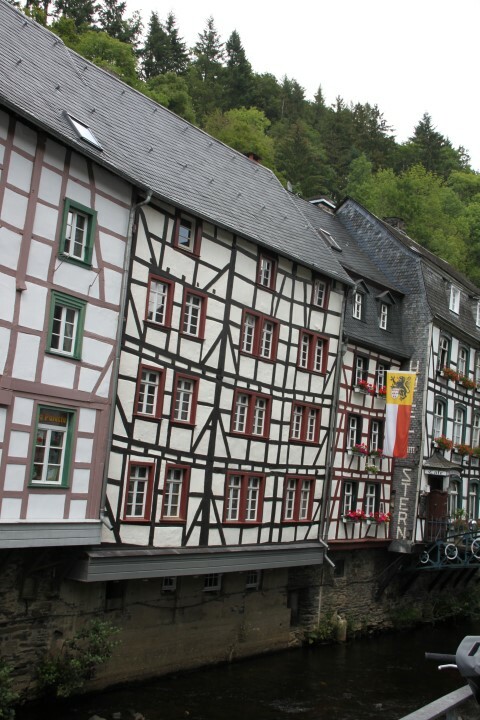 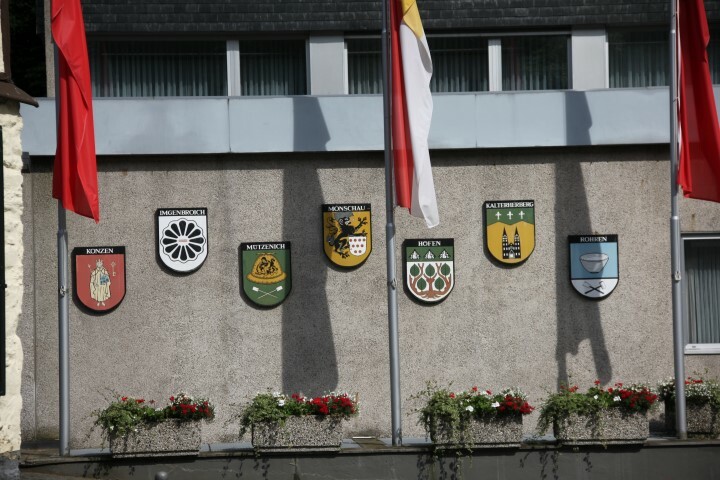 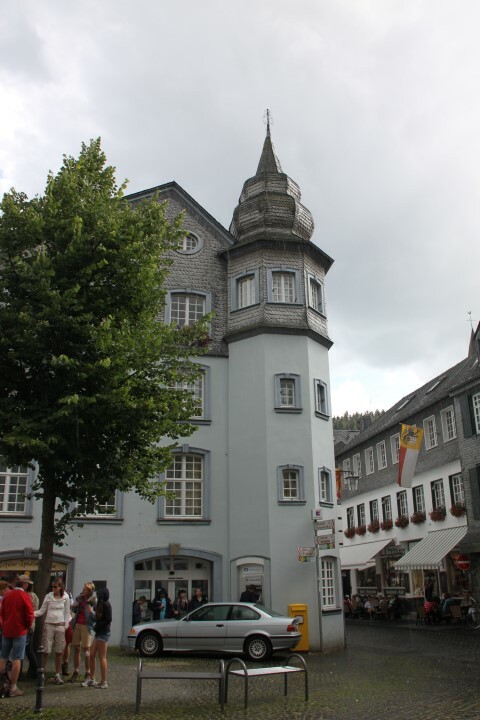 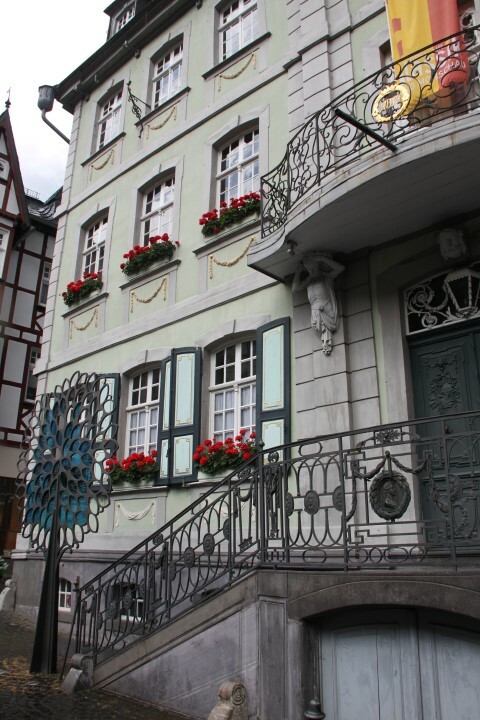 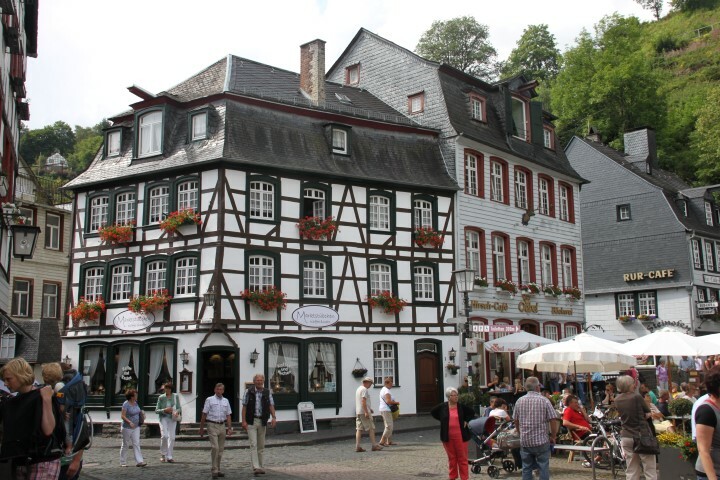 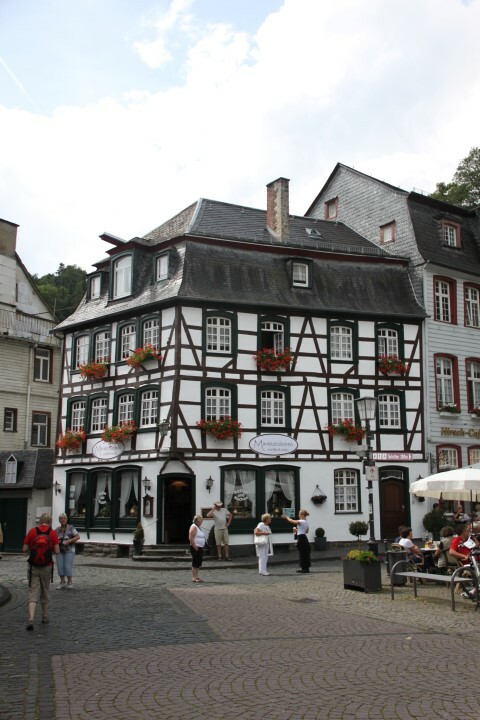 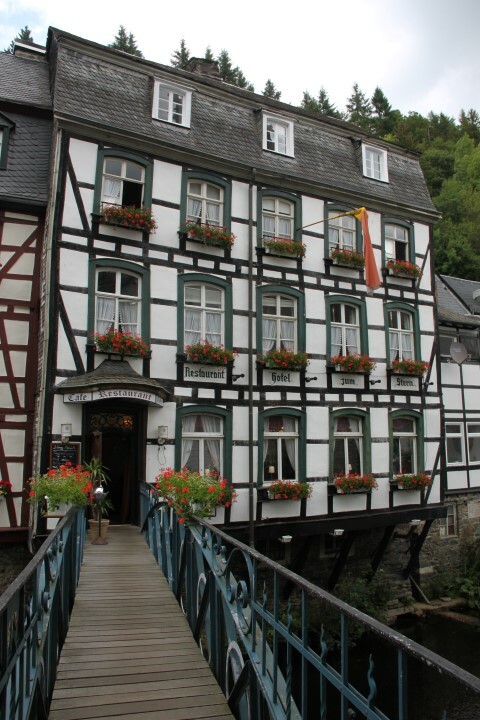 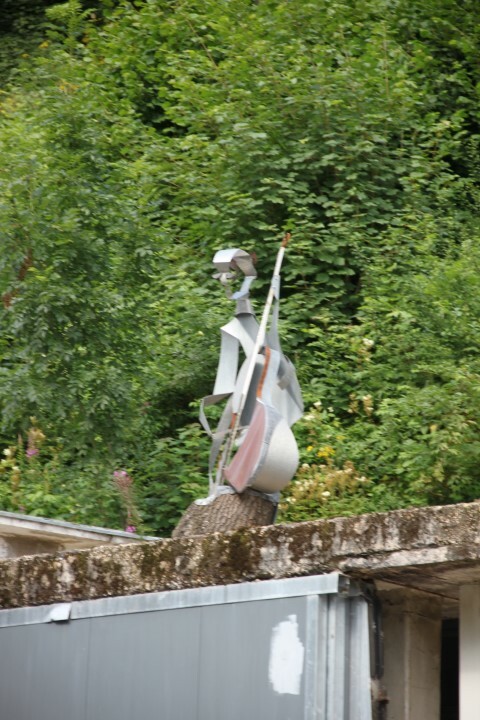 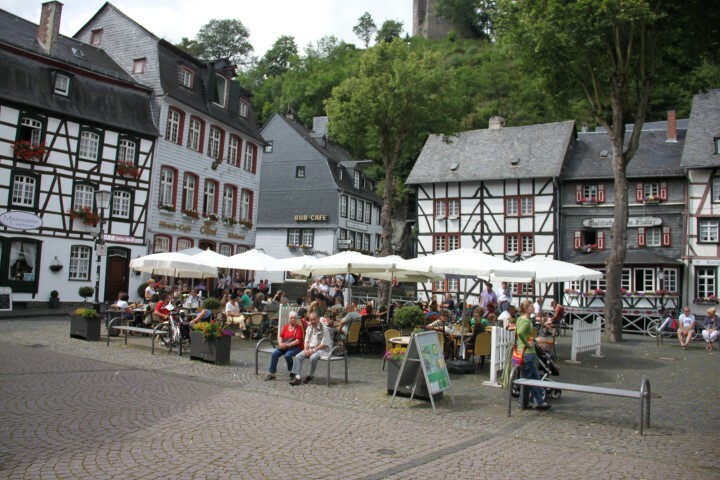 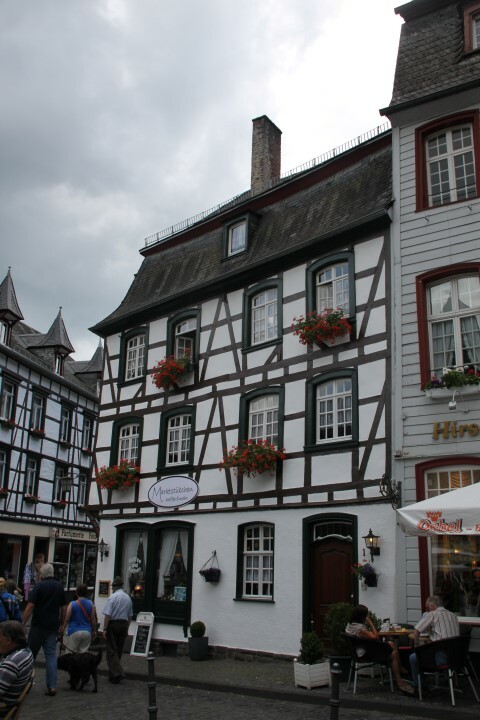 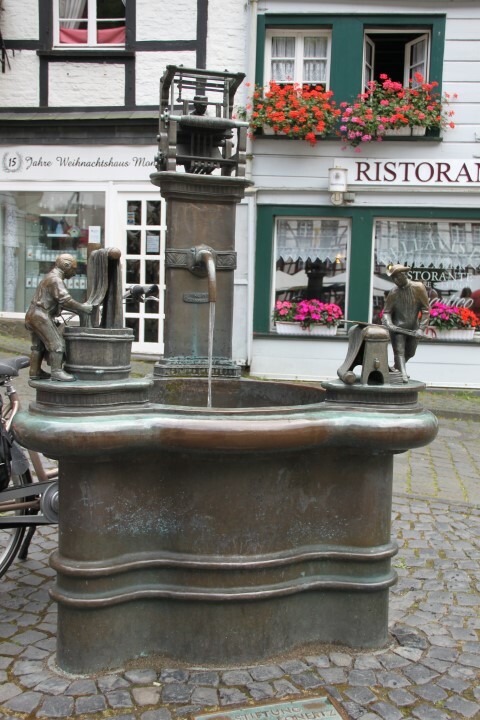 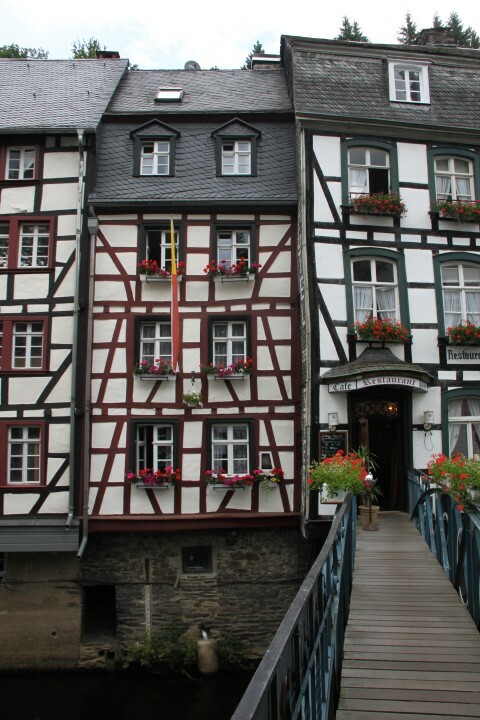 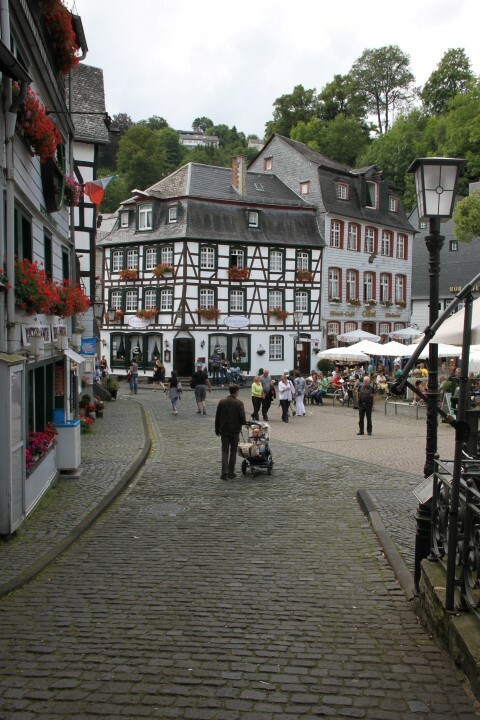 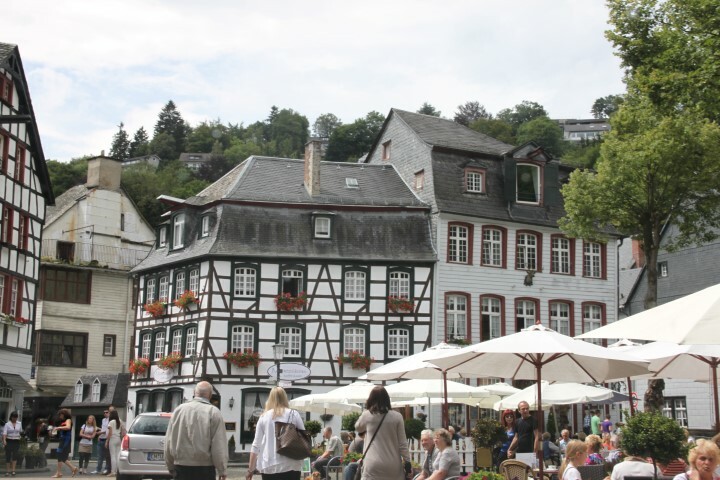 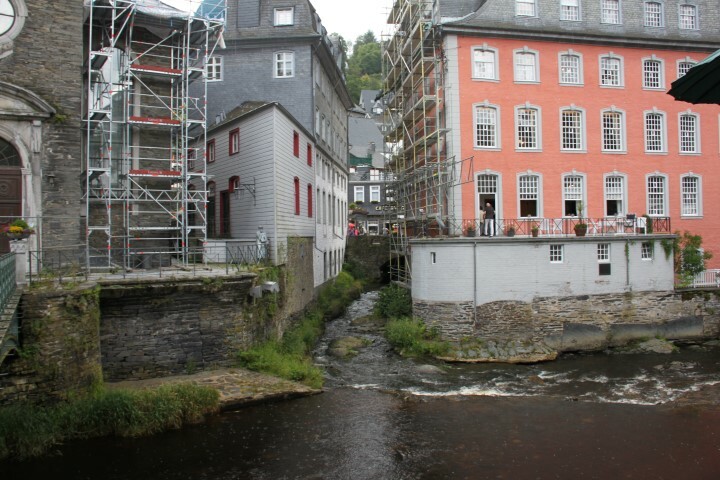 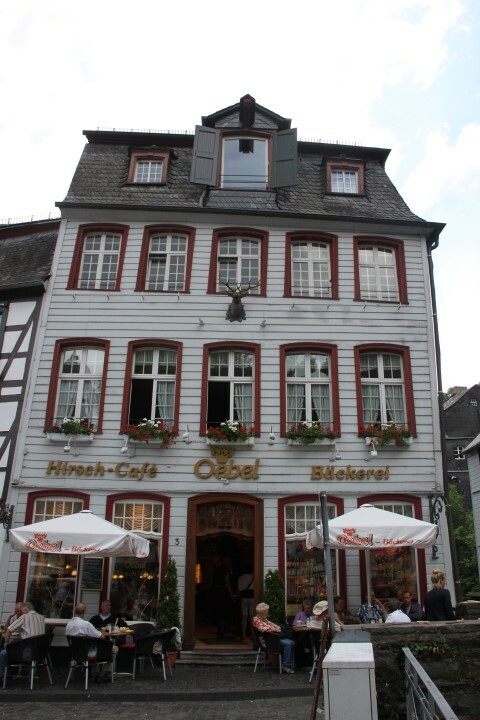 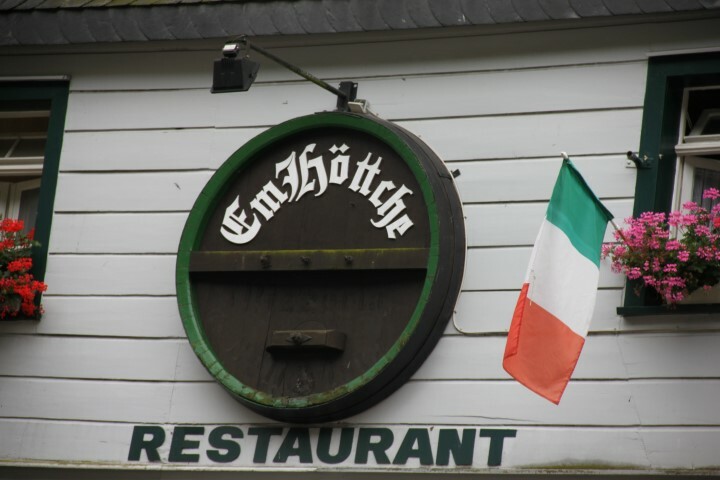 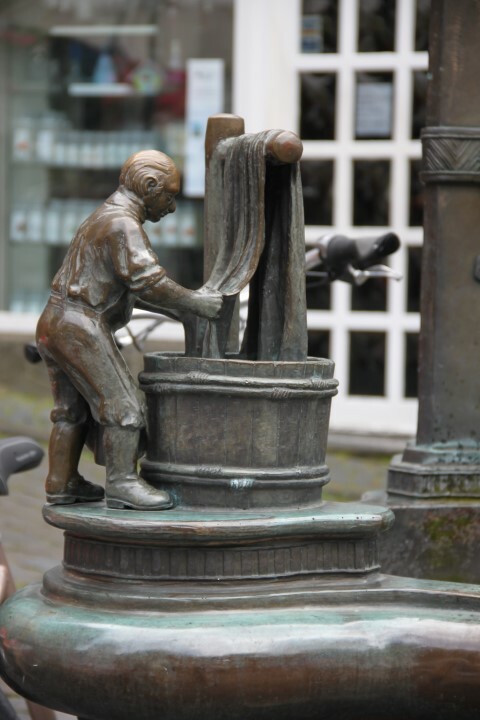 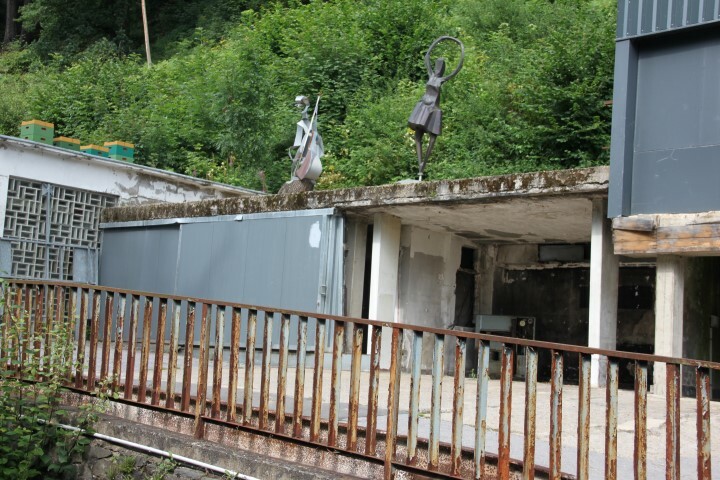 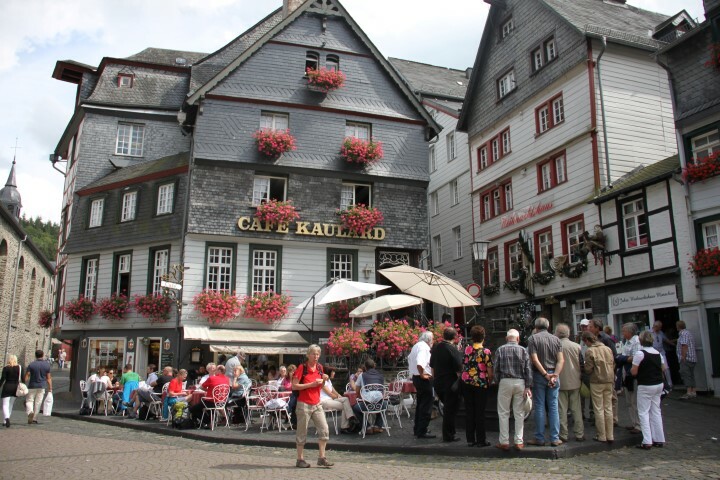 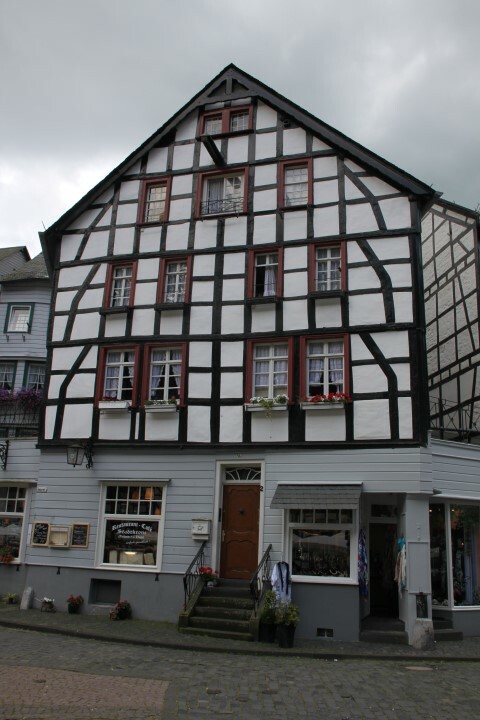 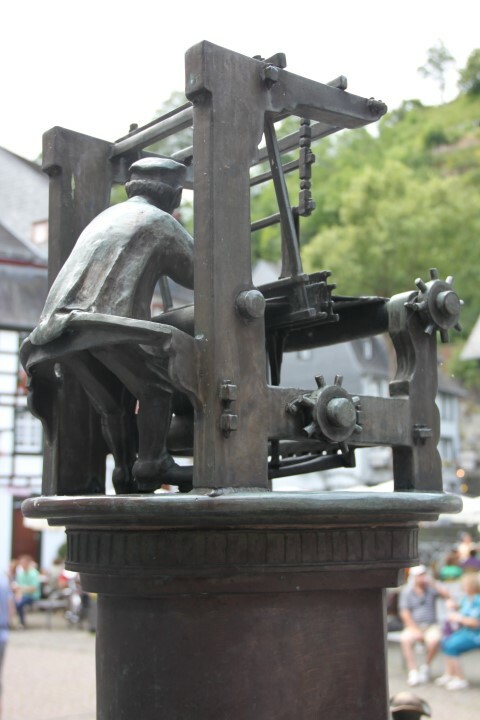 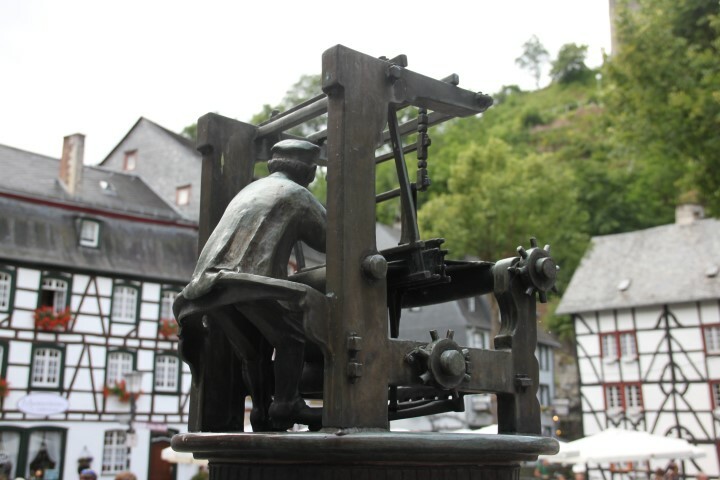 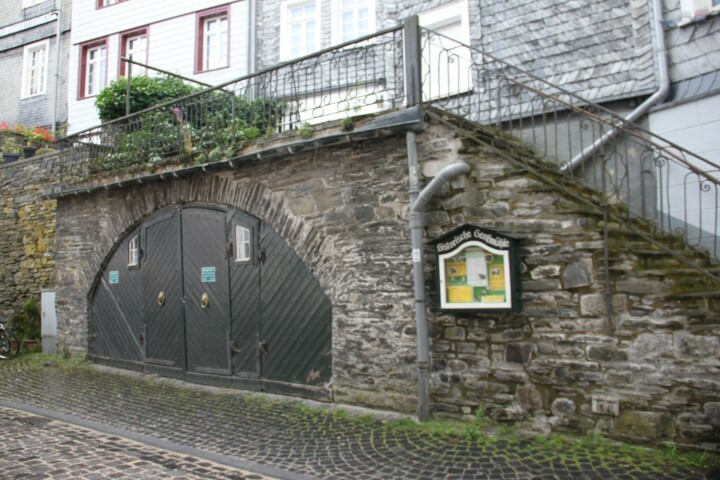 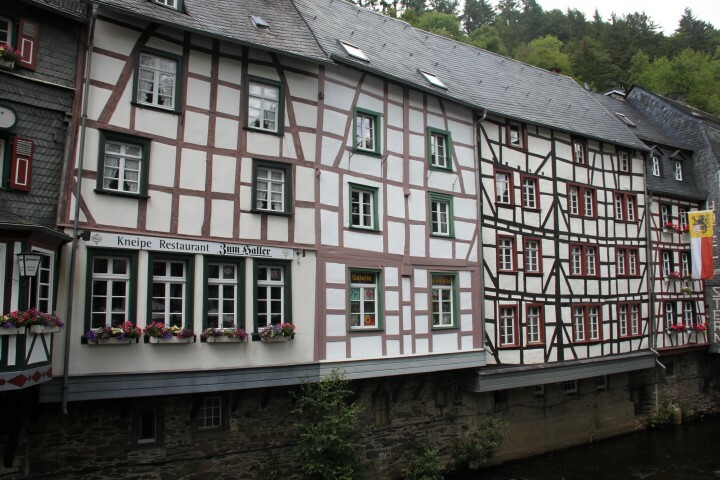 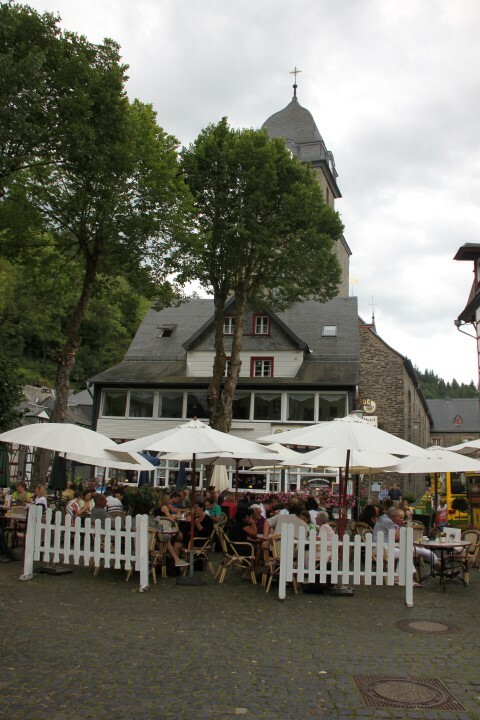 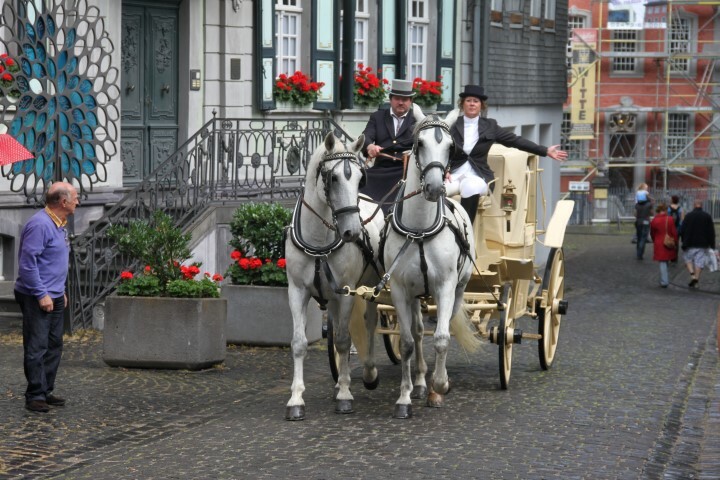 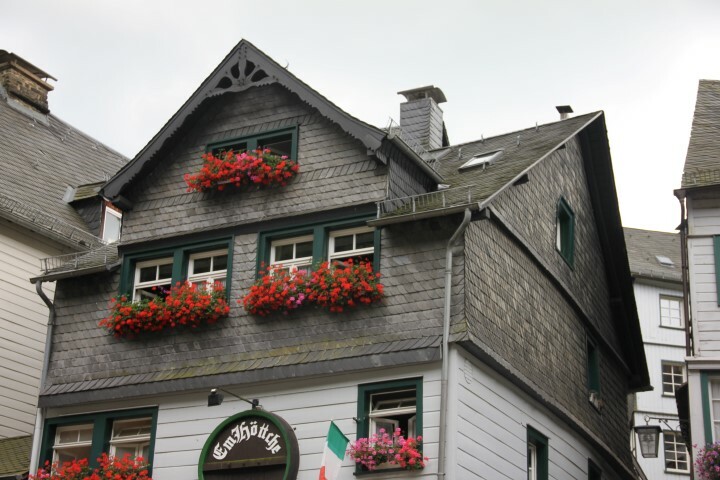 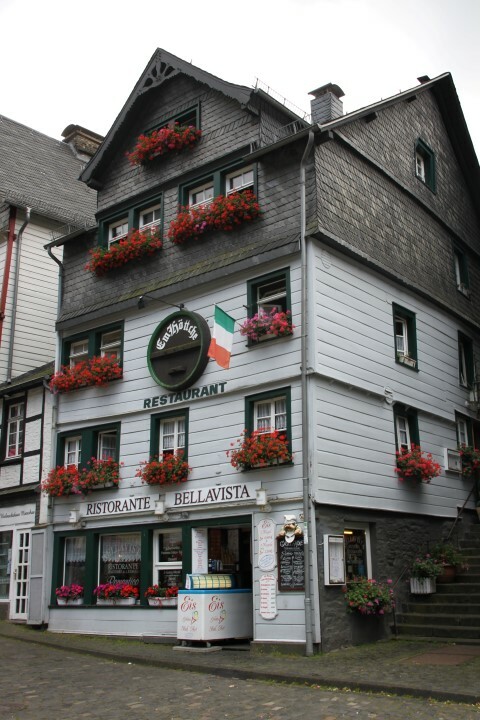 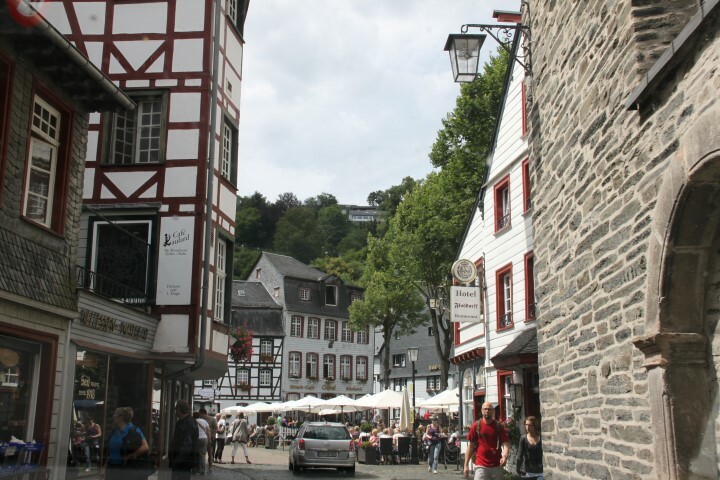 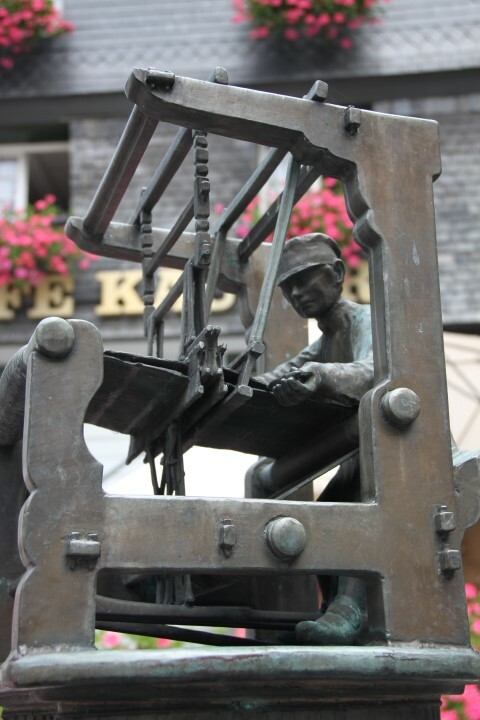 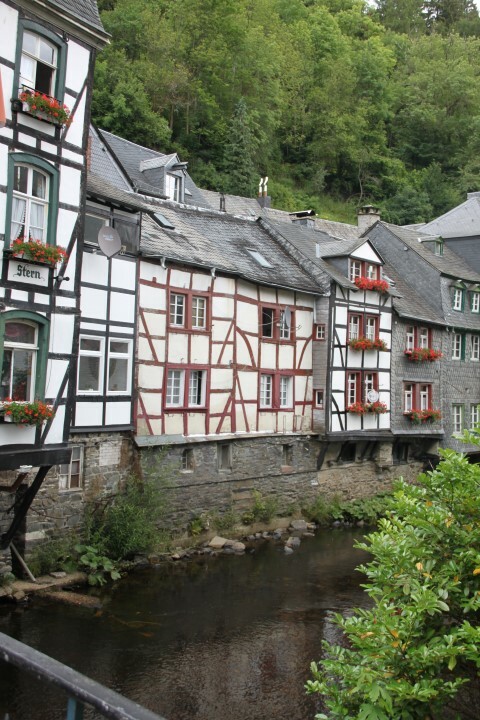 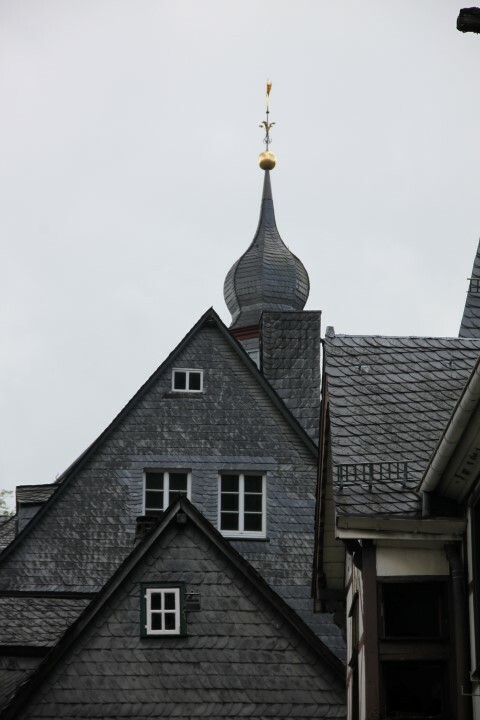 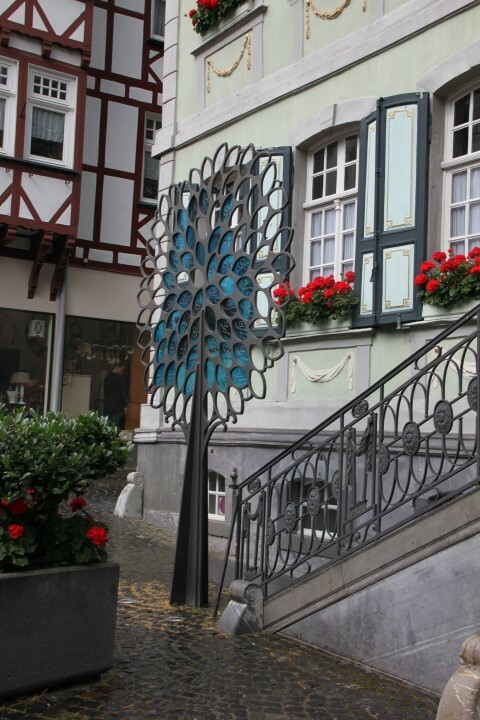 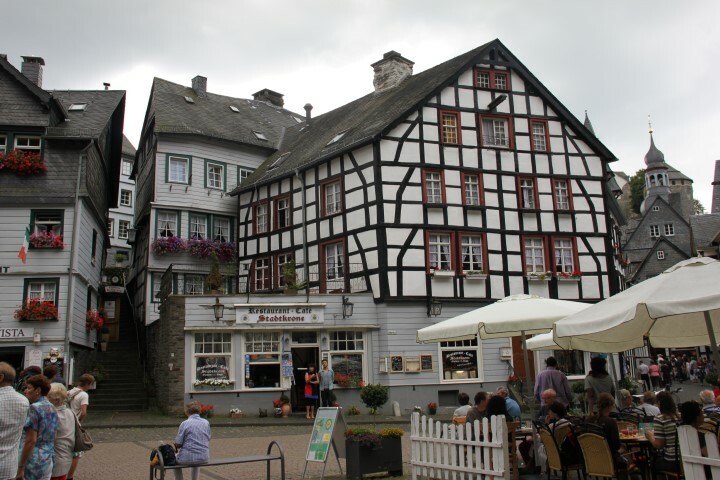 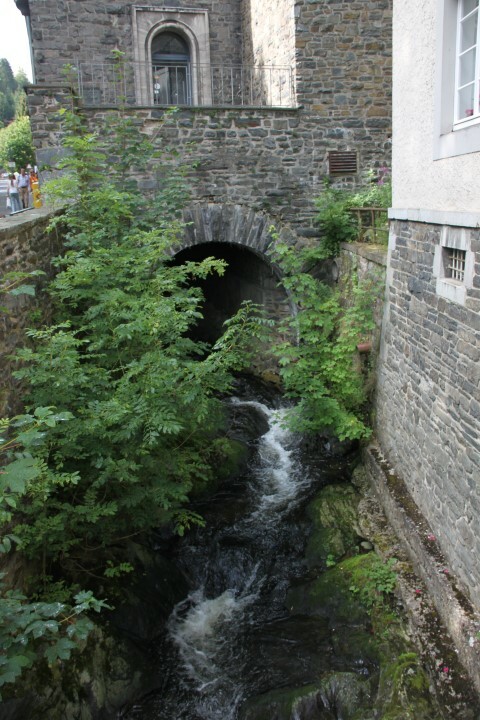 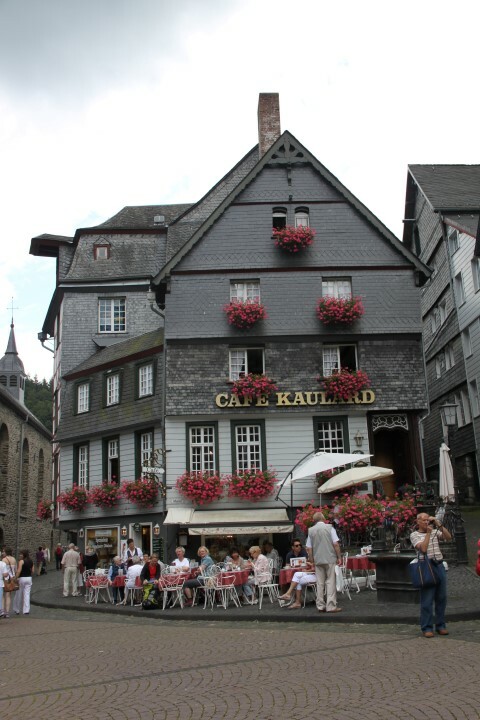 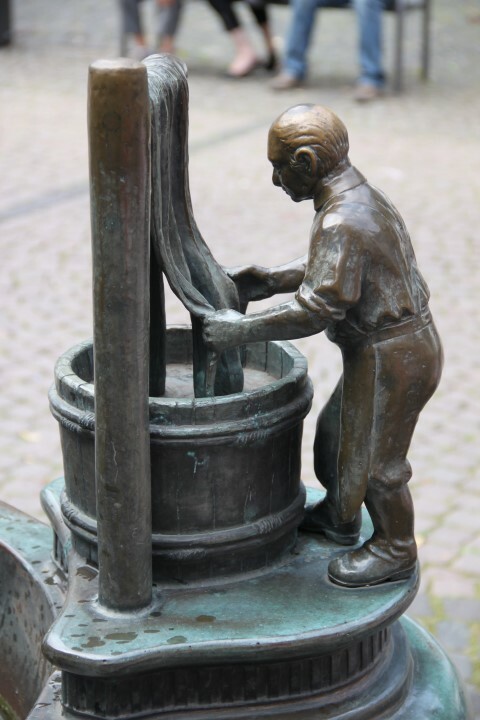 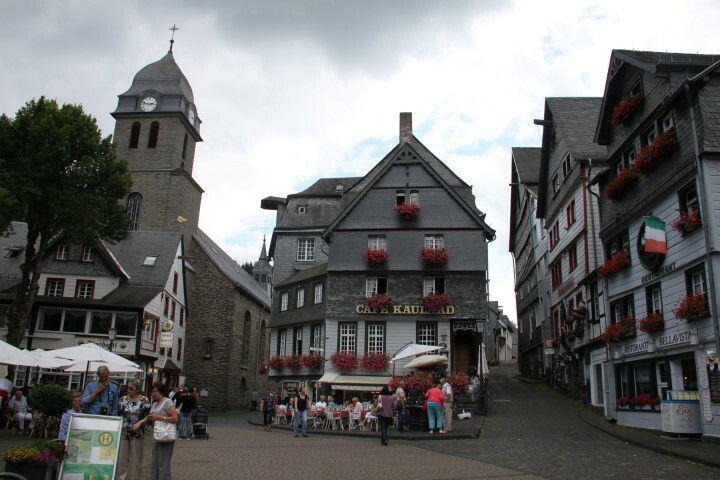 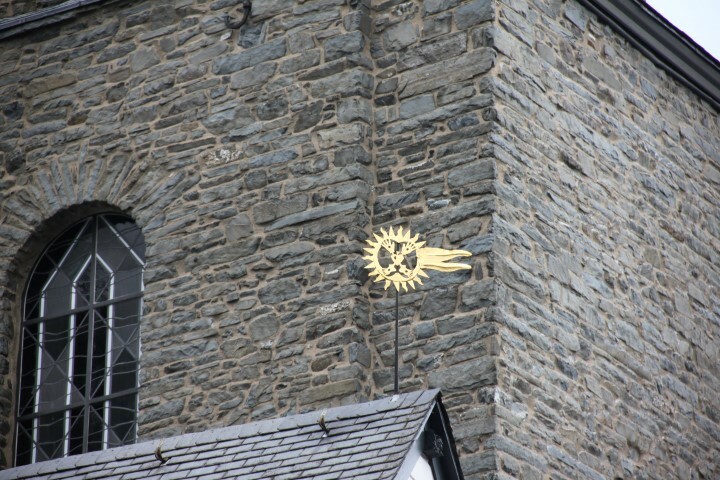 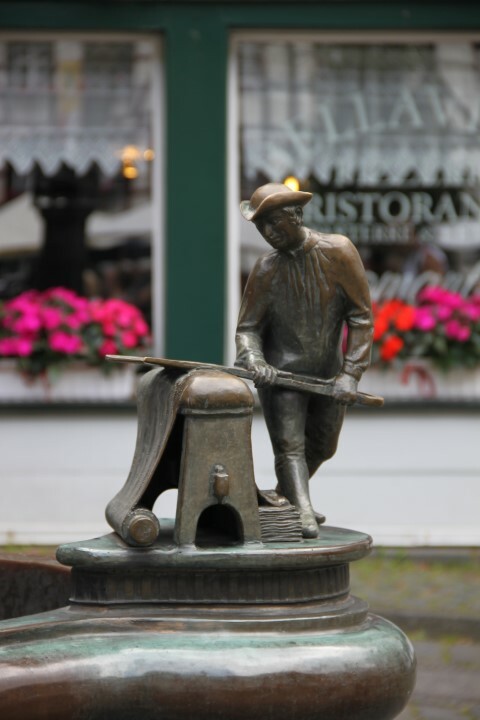 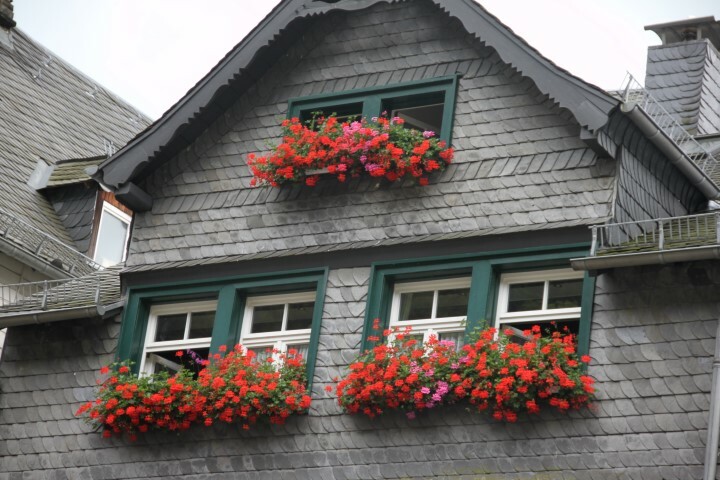 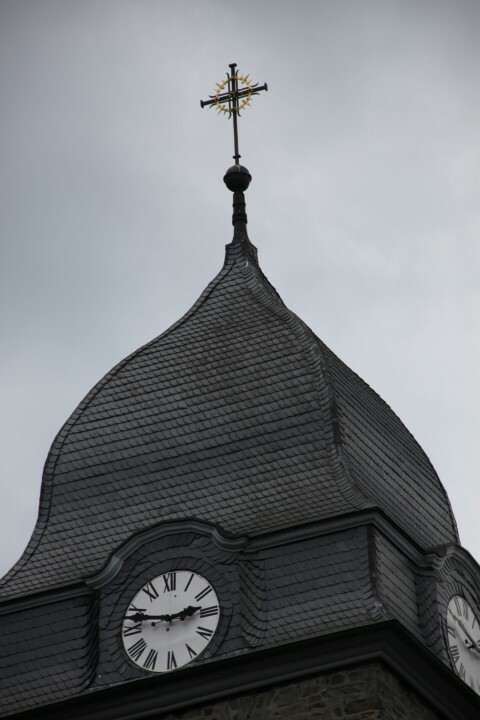 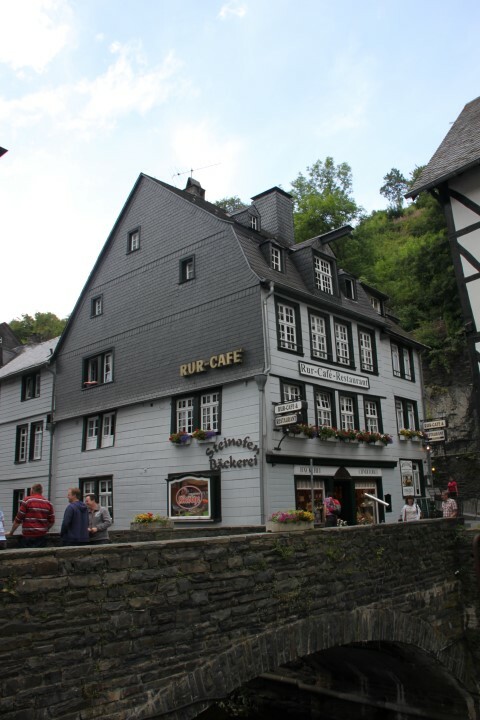 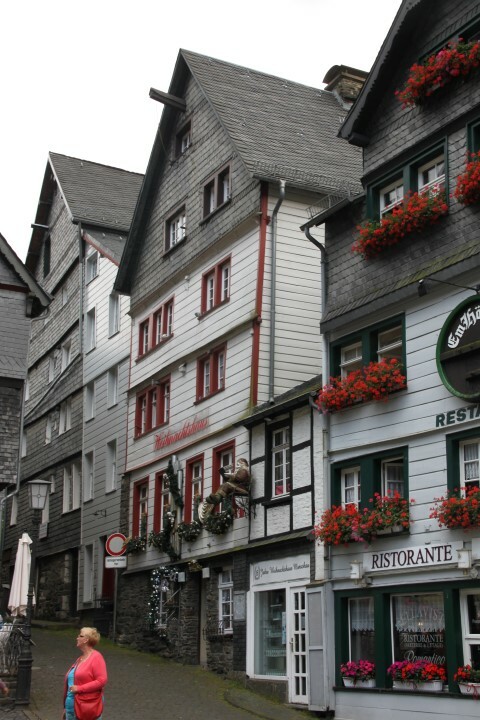 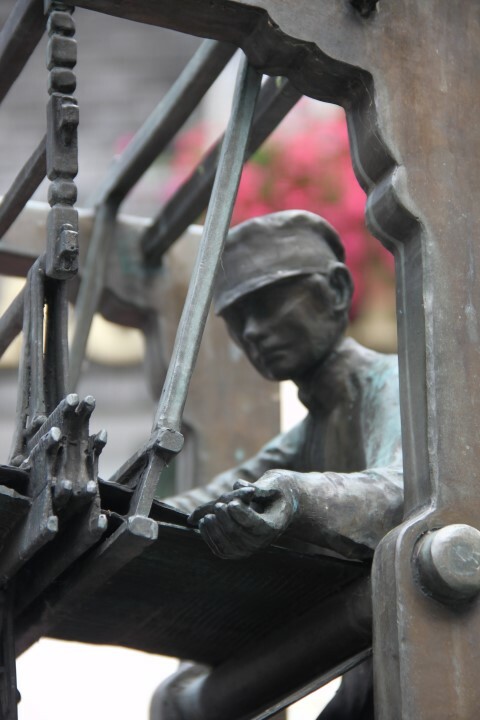 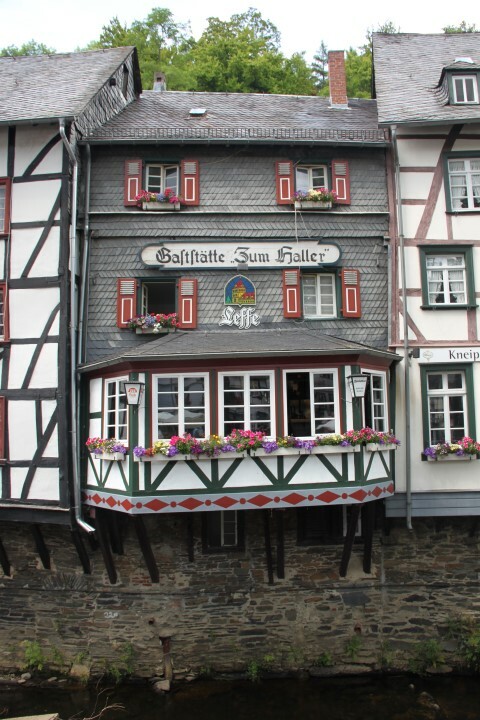 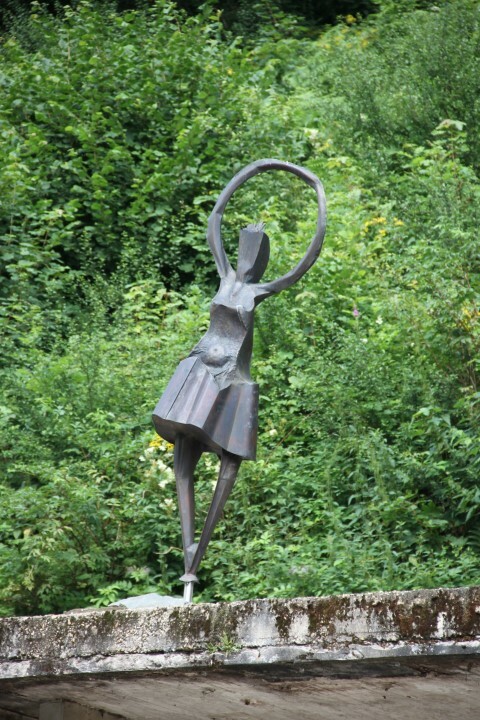 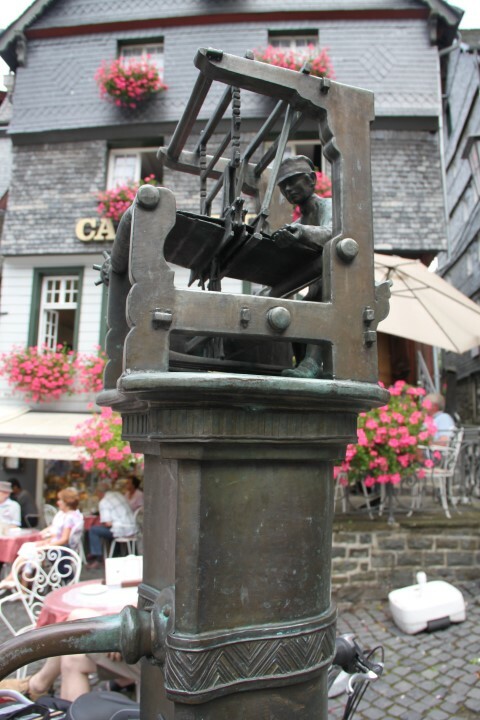 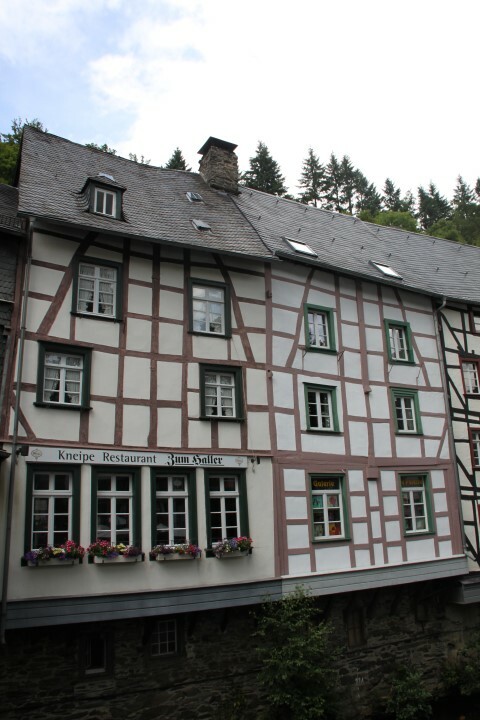 In this retrospective post about our 2012 summer travels, we have arrived at our next destination, another surprise for our visiting Singaporean friend “Velvetine”: the picturesque German town of Monschau. 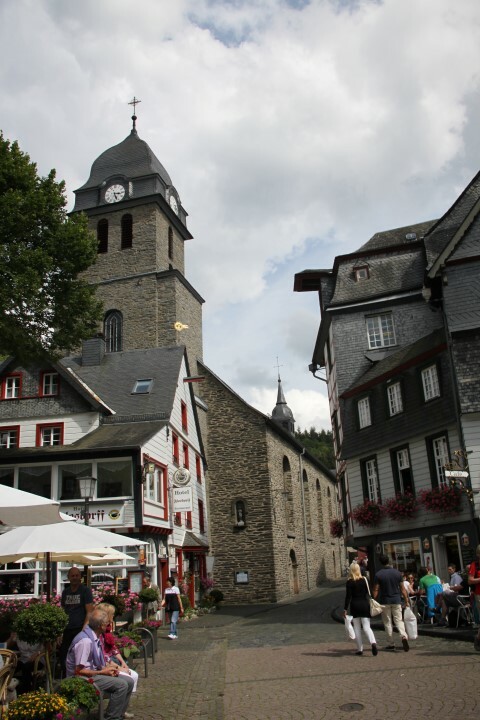 It’s a new place on my own travel list too, and as we enter town Himself is telling everyone that he visited here as a child and remembered it fondly as a quiet, but very pretty town that he wouldn’t mind to go back to one day. 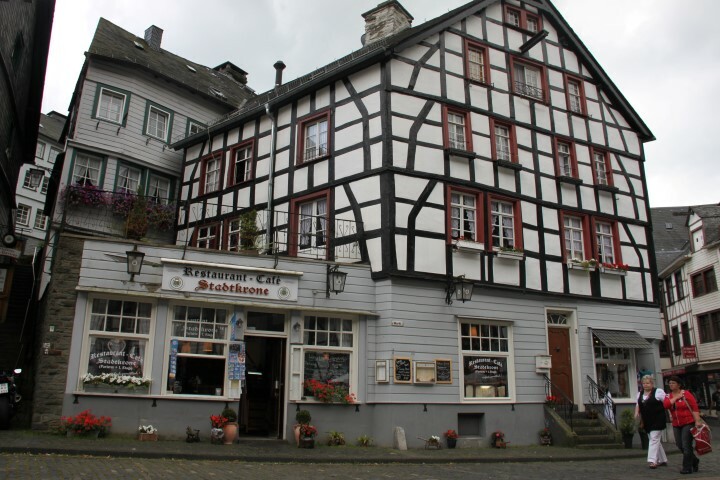 He even added that maybe it would be nice to find a hotel here for the night. 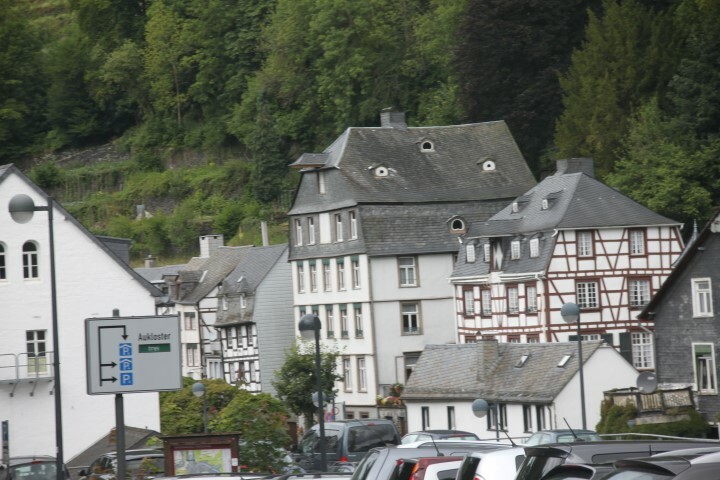 A few corners later we started to arrive in the town proper… and came accross one large tour bus, then another, and then a sign directing the way for tour bus parking. 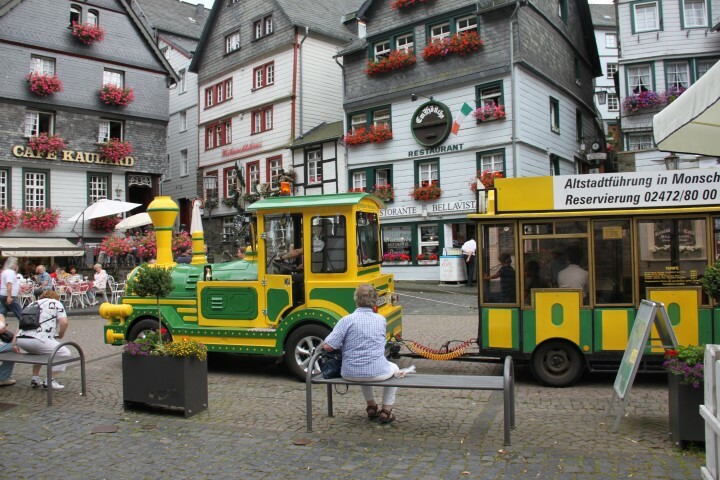 Then came the tourist trolley-train doing the rounds. 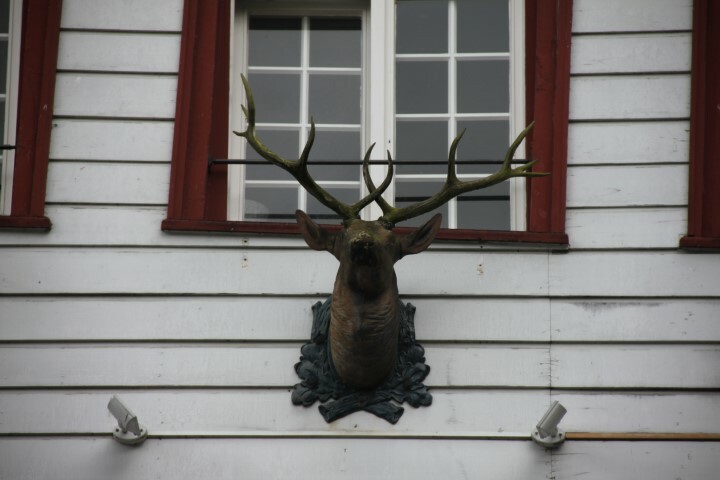 There was no car parking anywhere in sight either and Himself’s face was changing rapidly to one of horror as he realised that the town had changed beyond recognition from the one he remembered as a kid. 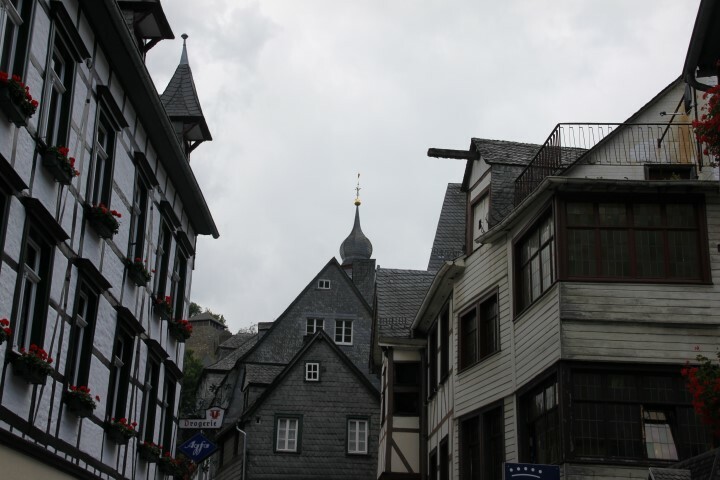 I like beautiful towns and cities, but both Himself and I usually prefer to avoid the worst of the tourist traps if we can.